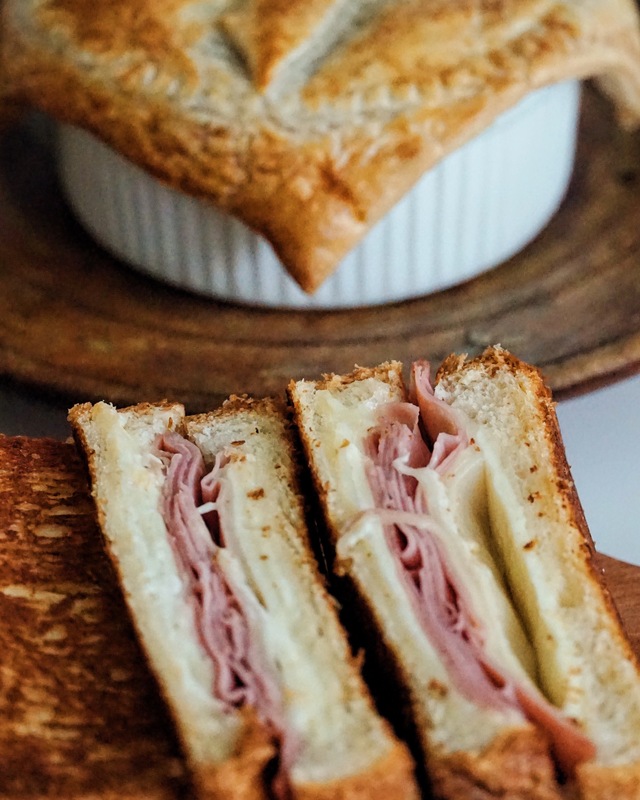 There’s now a recipe for a simple ham and cheese? Blasphemous!!! 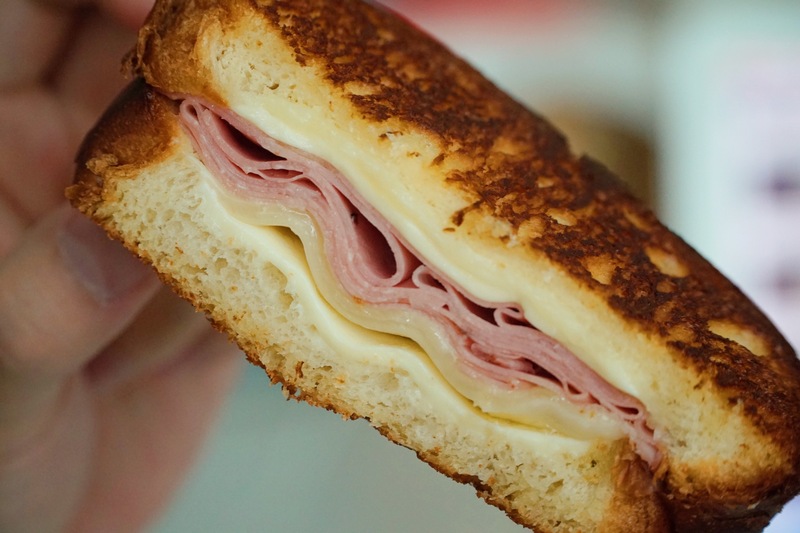 So it may be easy to slap some ham and cheese between two slices of bread and call it a ham and cheese. Indeed the basic definition of this sandwich is fulfilled. I just took it a step further that’s all, with the specific use of a certain type of ham, cheese, bread and other additional fillings (cravings of the day) to make it taste a little more special. 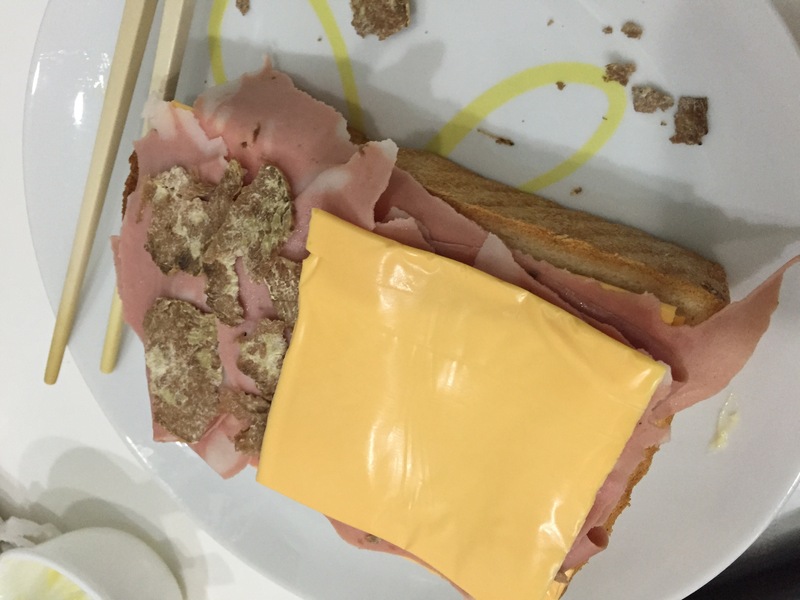 Sliced ham – I’m not so fond of the traditional Blackforest ham used in a ham and cheese, so I replaced it with Mortadella ham (I was lucky to have some Truffle Mortadella ham so I made this a truffle themed ham and cheese). This option is entirely up to you, you’d know best your ham of preference after all. 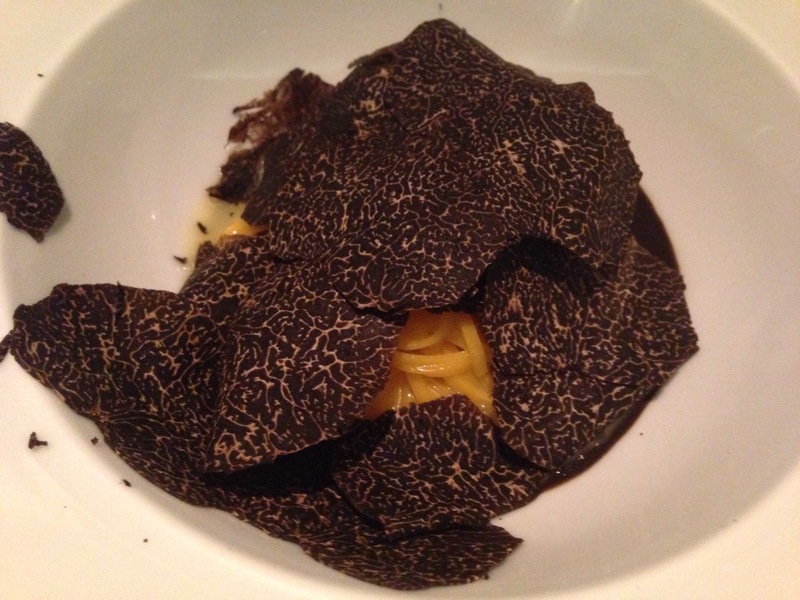 Optional – dijon mustard, truffle oil, truffles. I suggest you don’t mix mustard and truffle products though. Preparations coming along. 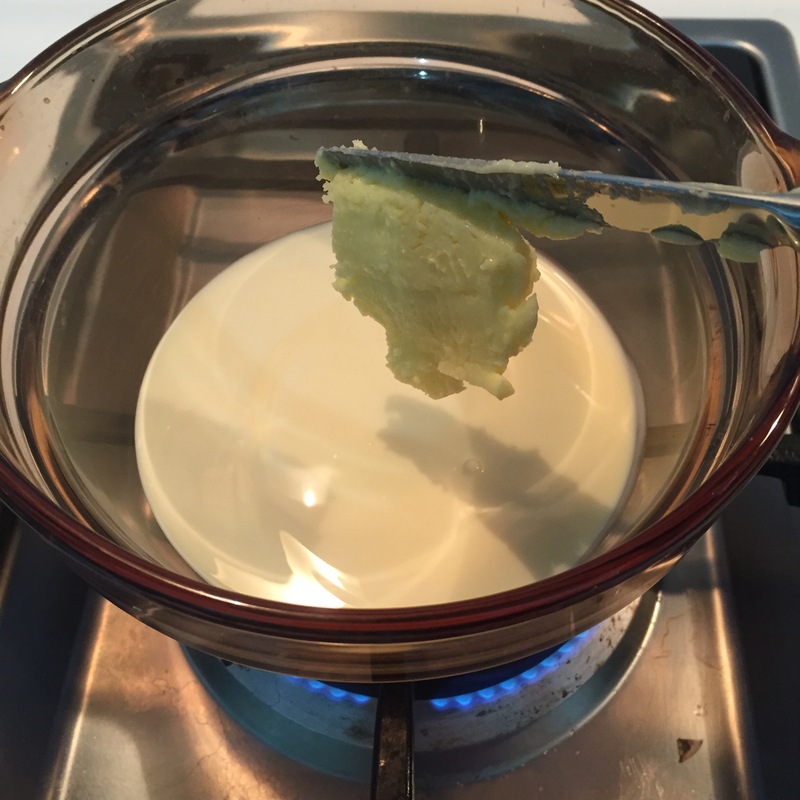 Cheese and butter at room temperature before use. Butter one side of the bread generously. 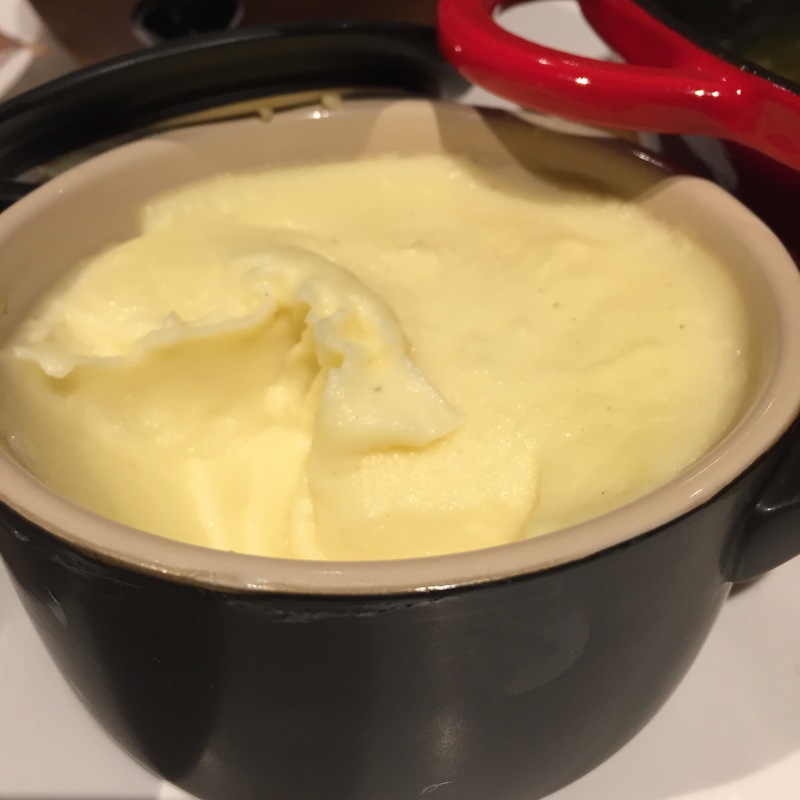 Get the butter into every nook and cranny and leave no surface unbuttered! Flip the bread over and start to assemble your sandwich. If you’re not using truffle, spread some Dijon mustard onto the unbuttered side of the bread before layering your cheese on top. Then add the ham, and more layers of cheese. As you can see below I’ve also added a couple slices of truffle and a little truffle oil before the final cheese layer. Yes, the picture is not the right way around. Oops. Top with the final slice of bread, and butter the outer surface of the bread. Both sides of the sandwich have to be buttered as you will be pan frying it. Place the sandwich in a frying pan large enough to fit it and turn the heat on very low. Slowly fry until the entire surface of the bread is an even dark golden brown. Then carefully flip the sandwich on its other side to fry the remaining side to the desired dark golden brown. Its got to be crispy but not burnt. Once done, slide onto a serving plate, slice it up and serve! Trust me when I say pan frying the sandwich makes a world of difference. It is not enough to toast the bread and butter it before assembling. Quick and easy, yet it does look pretty presentable! I suppose this isn’t so much a recipe, more of what works for me when it comes to sweet corn, young carrots and broccolini. 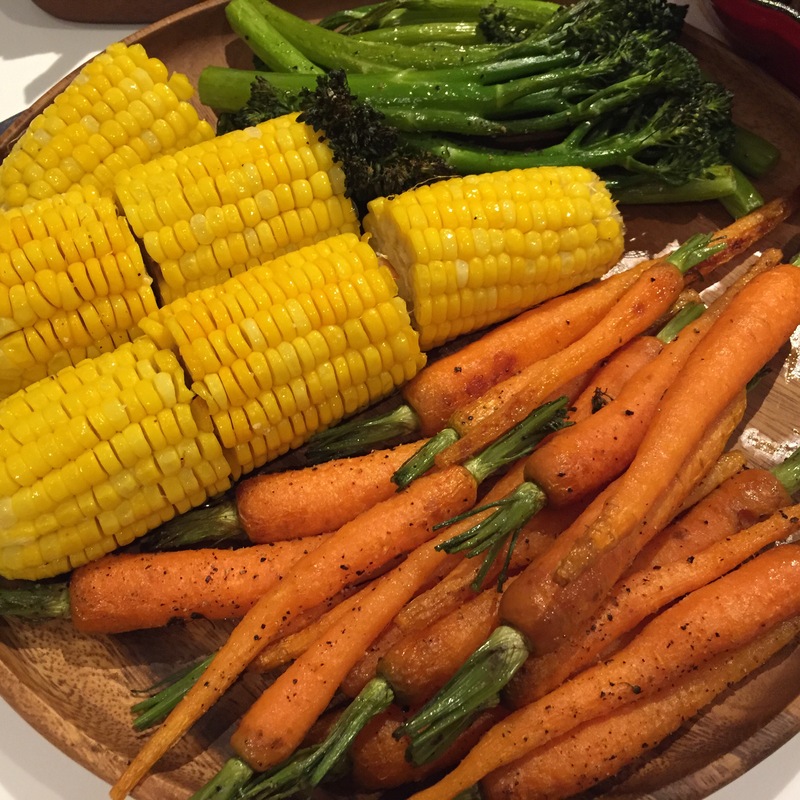 An oven temperature of 200-205 degrees celsius is recommended for these vegetables, and a short cook time of 15 minutes in the oven (sweet corn has to be steamed 5 minutes beforehand). A lot of recipes that I read require the vegetables to be in the oven for 45 minutes, but these vegetables would overcook and turn mushy. 15 minutes is perfect for them to retain some of their original crunch. 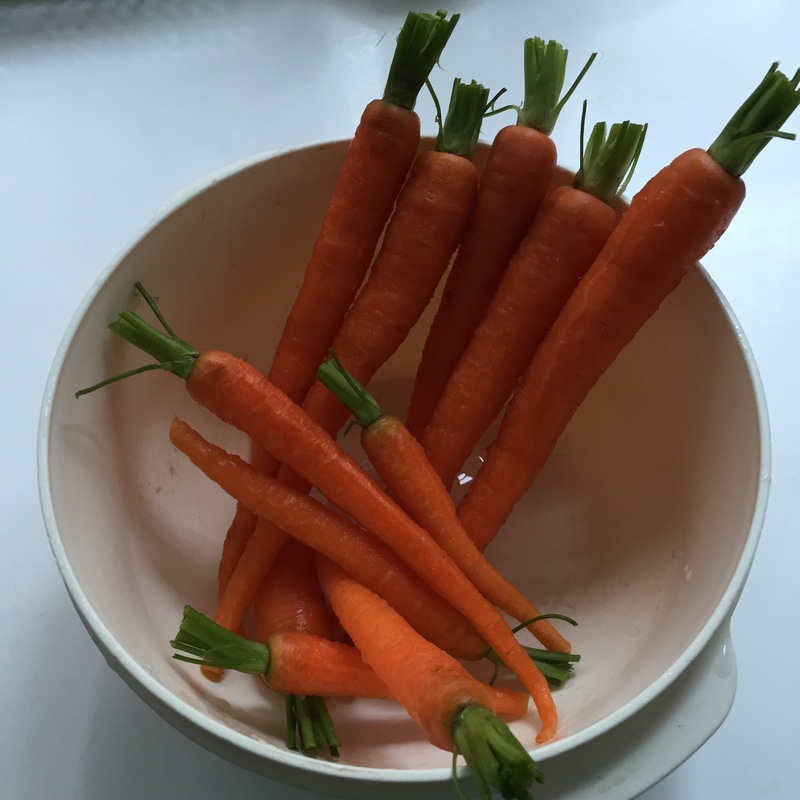 Carrots, trim the leaves off and use a small knife to scrape the surface of the carrot to clean. Rinse and pat dry. They’ll look like this after you’re done! Cut up the corn into three sections and place into a steamer for 5 minutes. Pat dry. Wash and pat dry the broccolini. 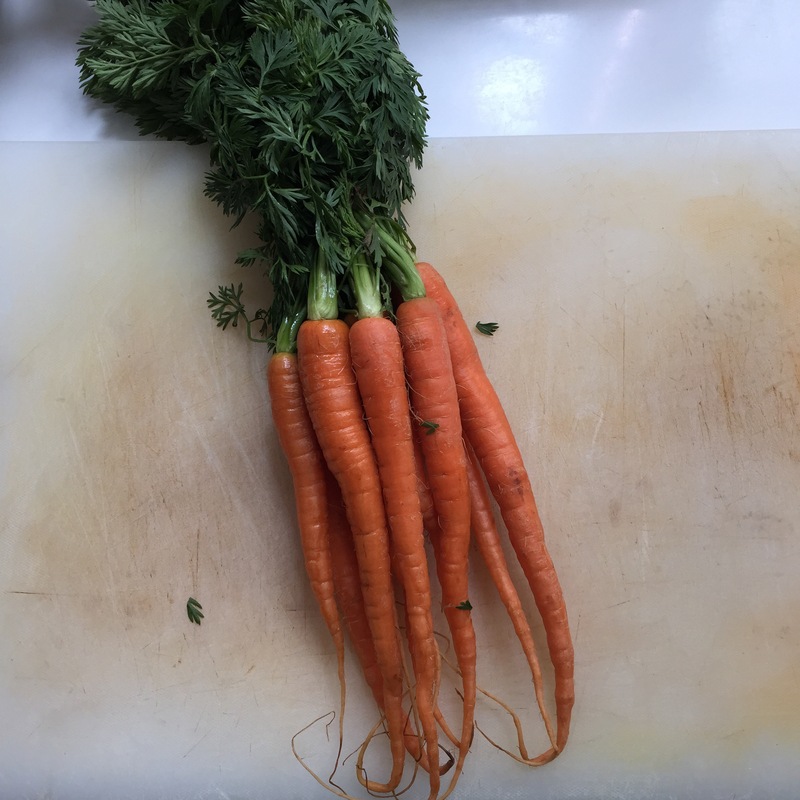 As I’ve repeatedly mentioned throughout this post, always make sure the vegetables are dry before seasoning and roasting. No one likes mushy vegetables! Broccolini:- again, very thinly dressed with olive oil and seasoned with salt and pepper. 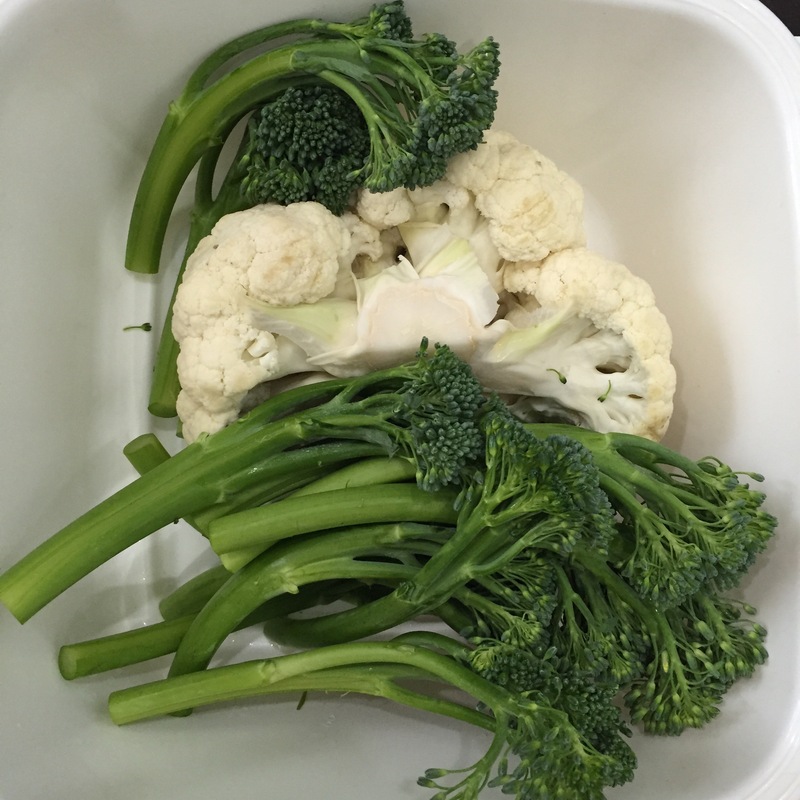 Lay out the vegetables on an aluminium foiled sheet tray and roast for 15 minutes at 200-205 degrees celsius. 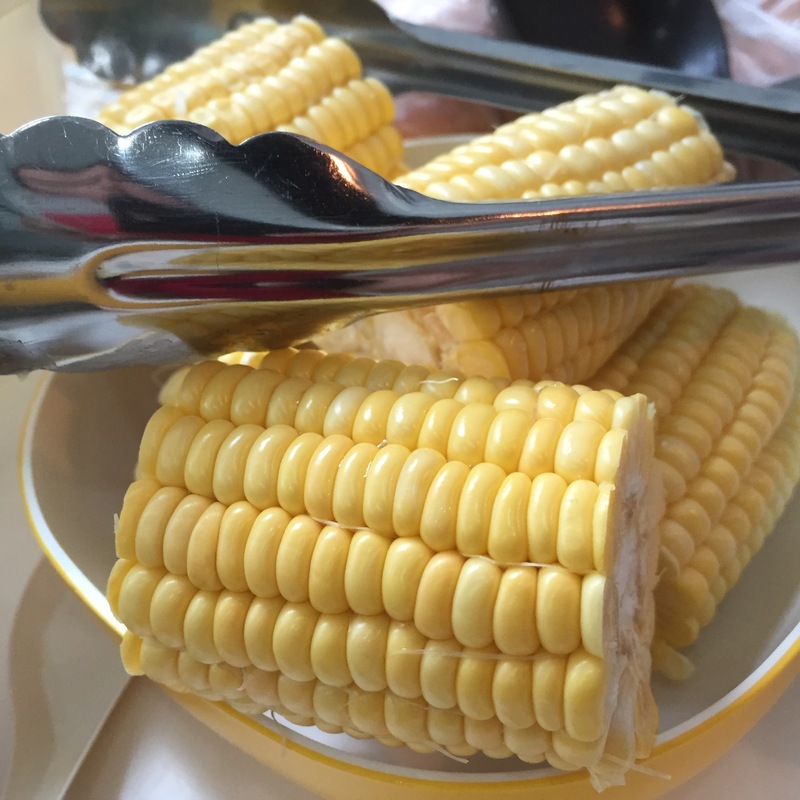 Place the vegetables on a serving plate and brush the corn with some butter before serving. This is a tray of roast vegetables which were cooked differently, also at 200 degrees celsiuse but for 45 minutes. 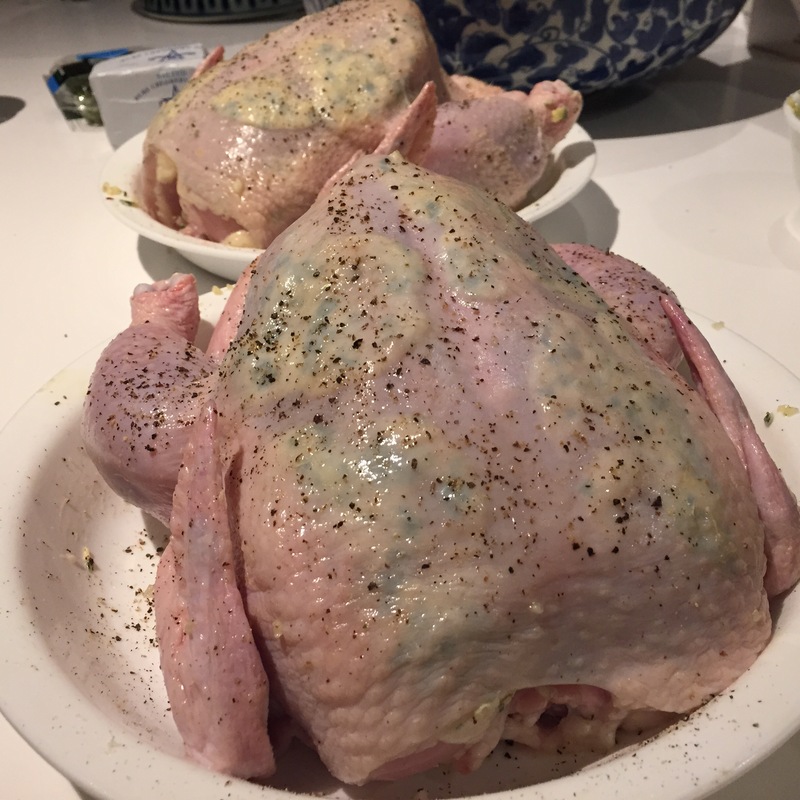 Seasoned with olive oil (I suspect I didn’t add enough oil), salt, pepper and garlic powder. Not bad actually. I tried to keep the vegetables the same size as much as possible so they’d cook at the same pace. Will try this again with more oil! Yes I know, there could’ve been a better picture of it. I should have done it justice and posted something that represents the texture and creaminess of it all. As it stands, I’ll just post the recipe for it so someone else can have a go and take food magazine worthy photos of this decadent side dish. 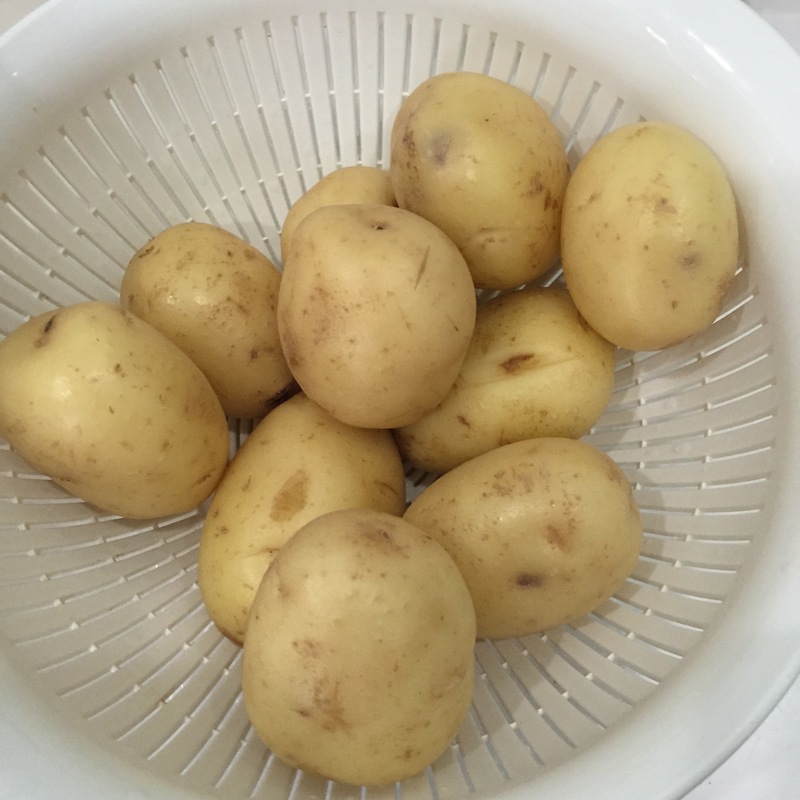 Place the potatoes in boiling water and reduce the heat to medium low. Cover and cook until tender (1/2 to 1 hour). Drain and cool the potatoes. Peel the skin off. 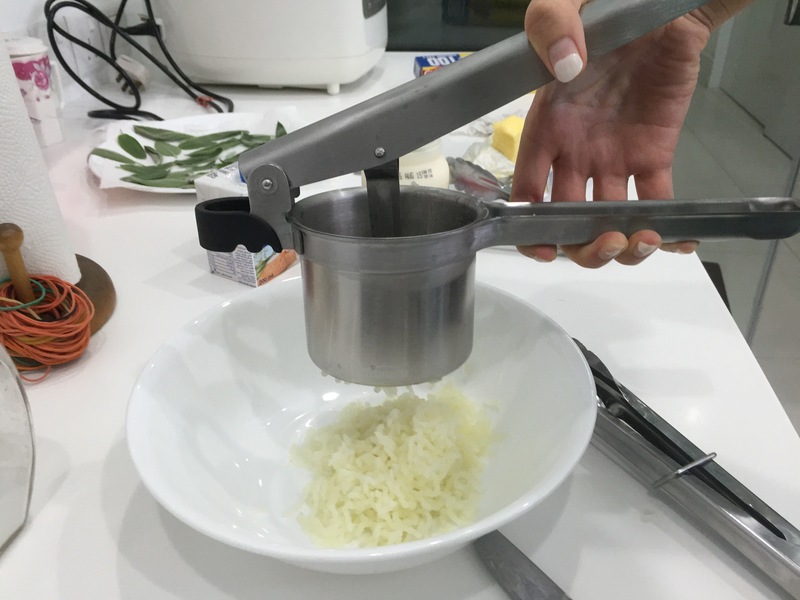 Pass the potatoes through a ricer. This is a new toy of mine. 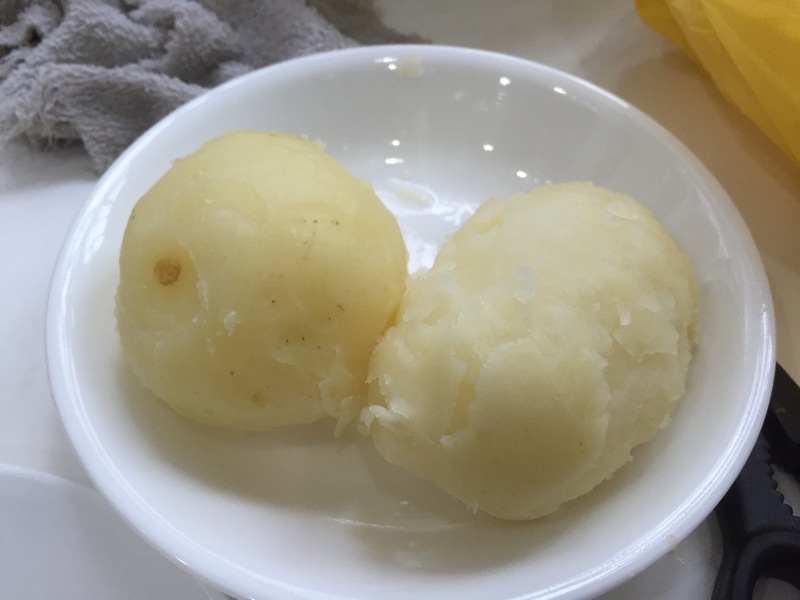 It ensures that the mashed potatoes stay fluffy and airy since you don’t have to mash it do death by hand, and therefore it also keeps the potatoes from getting gummy. Potatoes all pressed through the ricer! 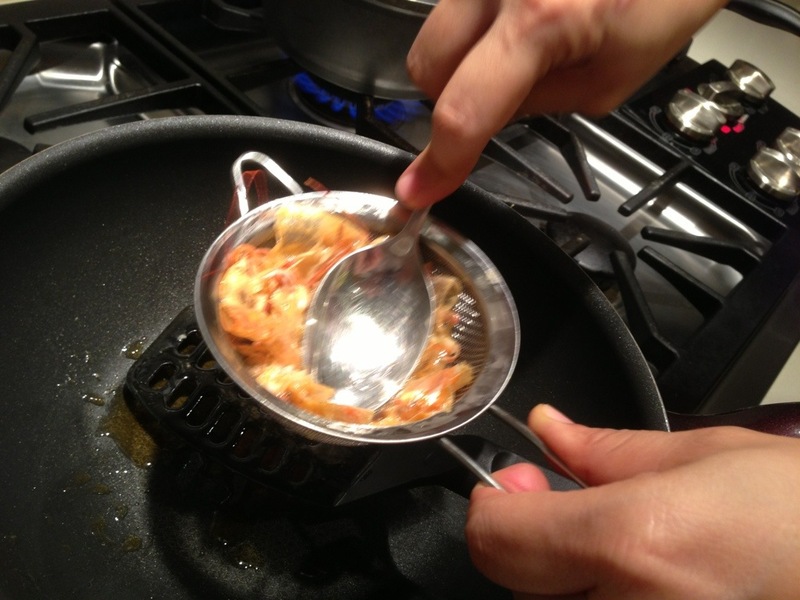 Pour the cream into a sauce pan and bring to a simmer. 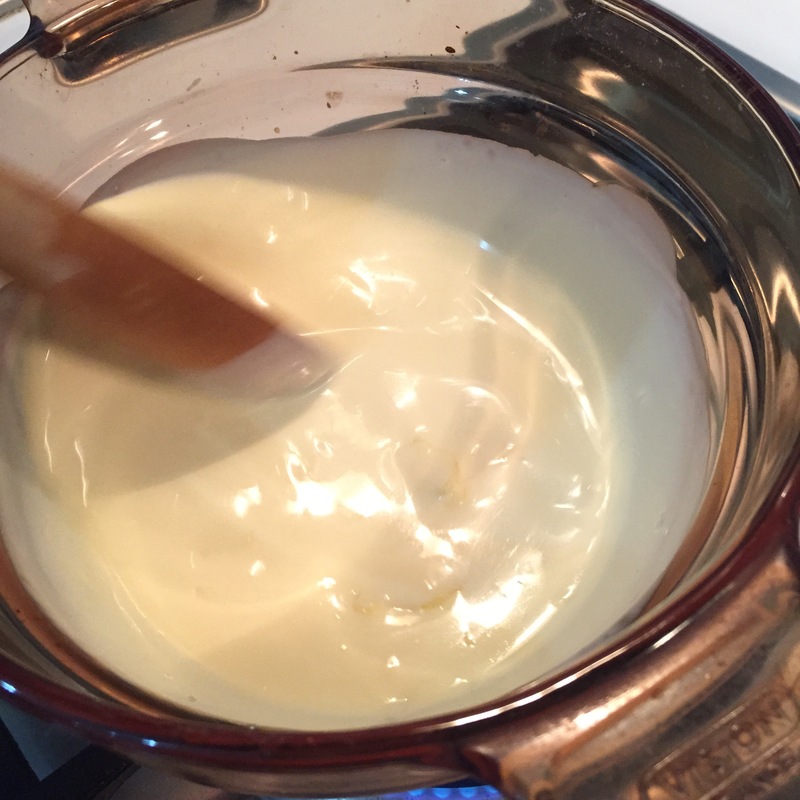 Slowly mix/whisk in the butter until sauce is emulsified. I actually used more cream than what is stated in this recipe. Then stir in the potatoes, and season with salt and pepper. Eyeball the creaminess and add more cream if you wish. After which, I sieved the entire pot of mashed potatoes. And the result? The fluffiest, creamiest mash ever! 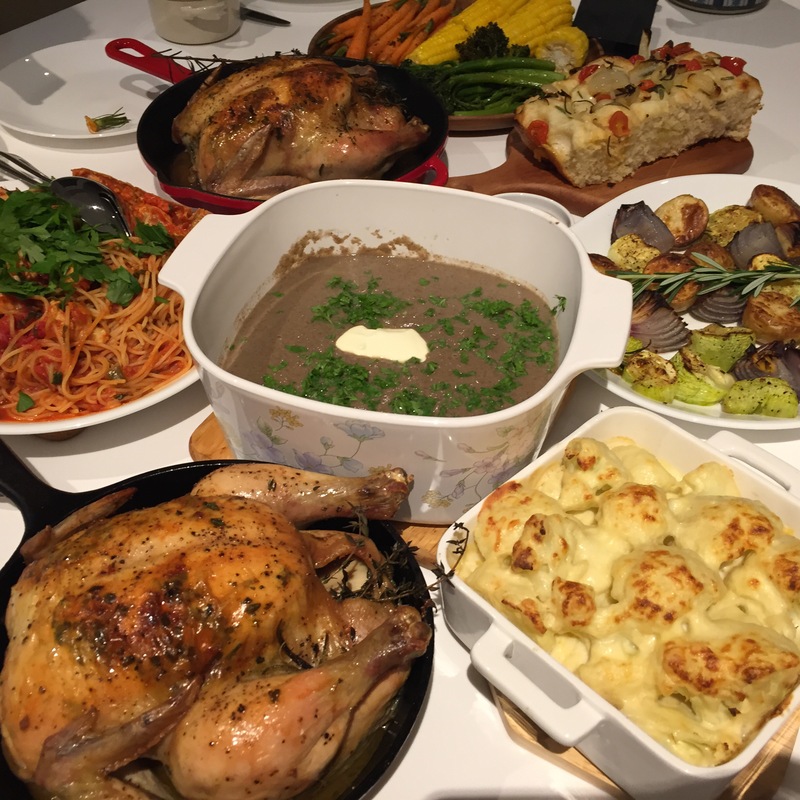 Roast chicken dinner for the family! 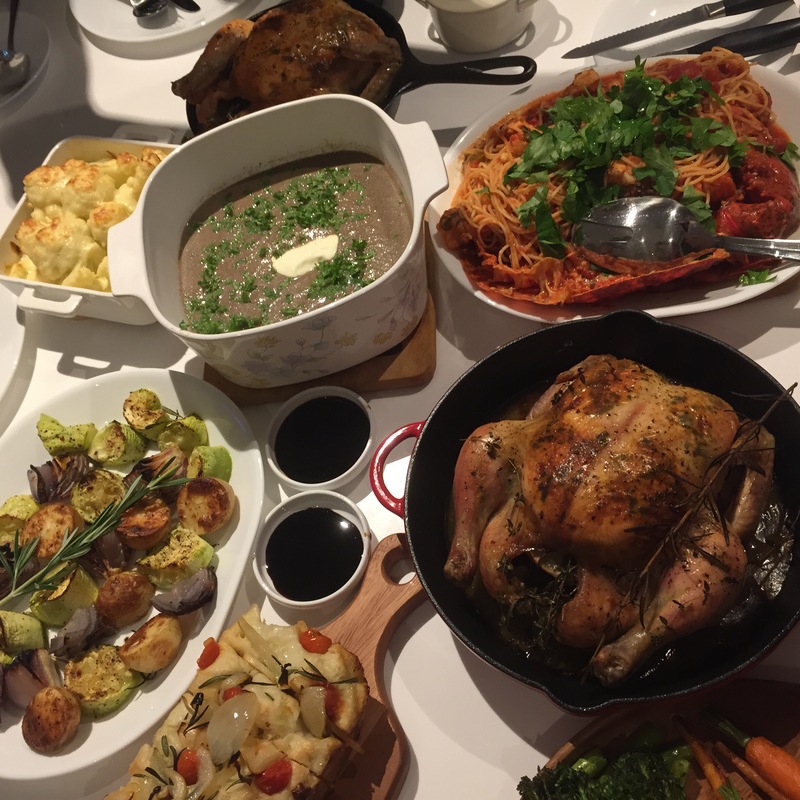 There’s nothing quite like a full roast at the dining table… and no, Nandos and Kenny Rogers do not count. 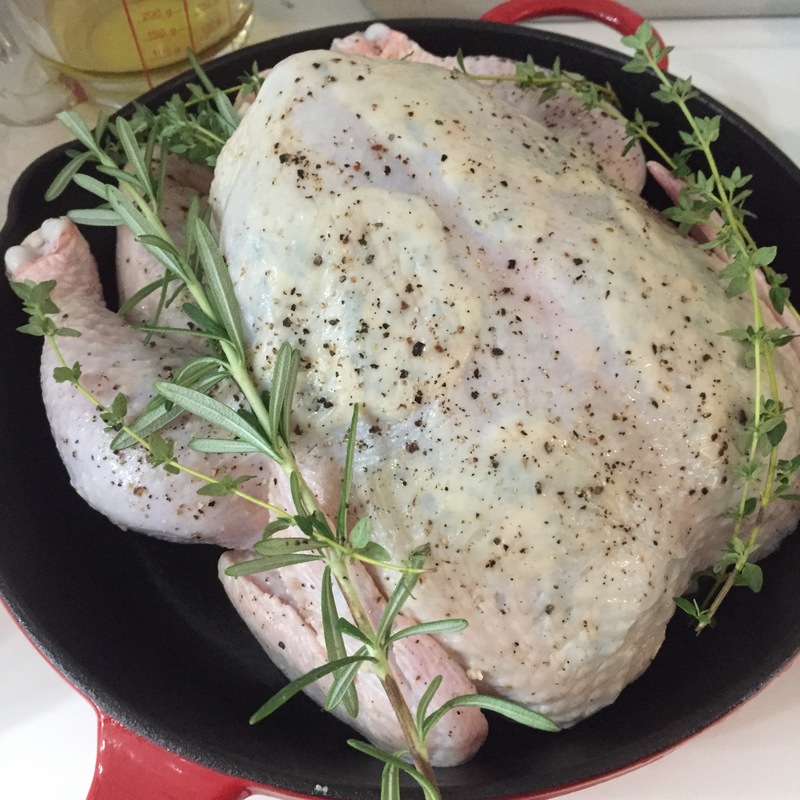 Roasting a whole chicken (or just the thighs as I will show later on in this post) is actually easier than one would think. 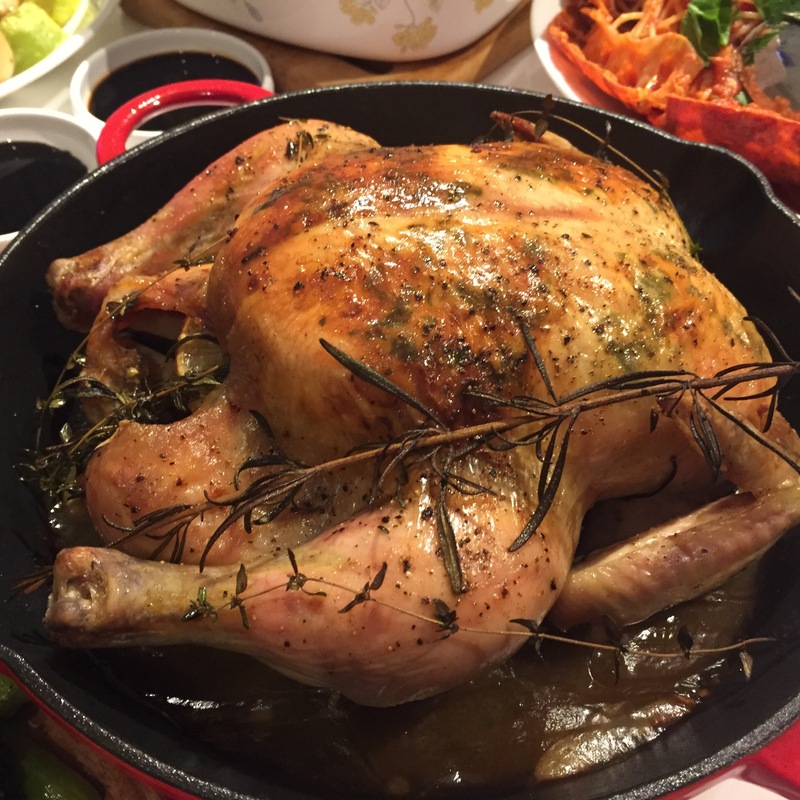 Fresh out of the oven and piping hot, it releases a perfumed steam as you cut into the juicy roast. Absolutely divine. 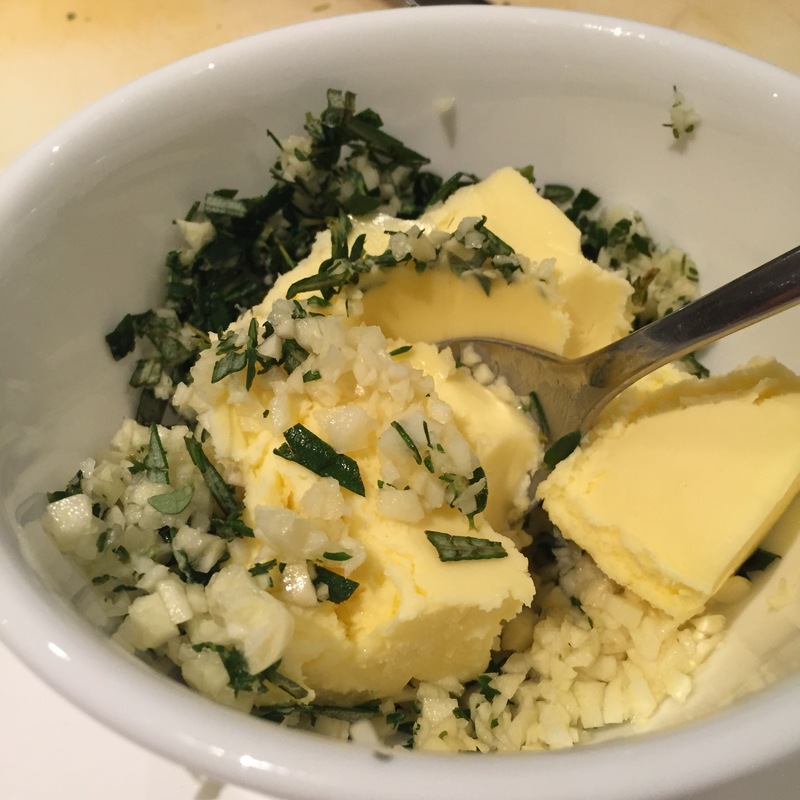 In a small bowl, combine the butter, chopped thyme, rosemary and garlic to form the compound herb butter. 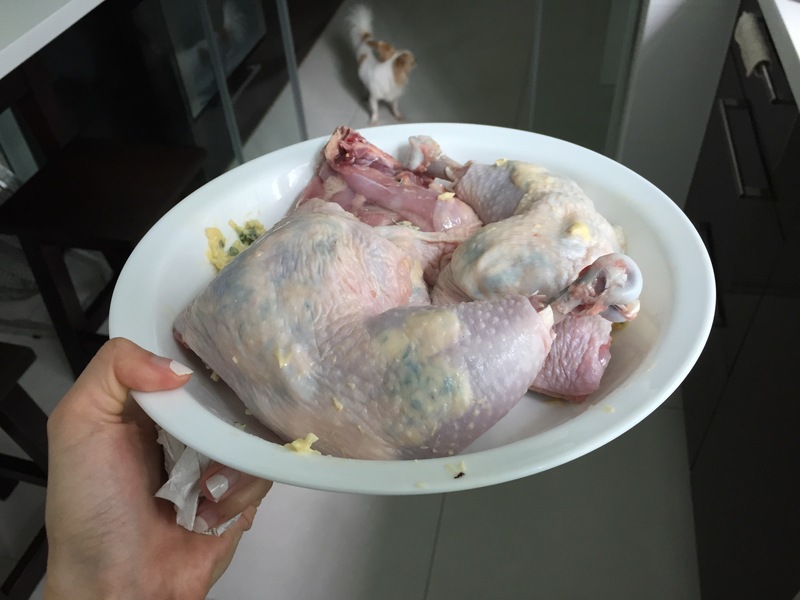 To prep the chicken, remove feet, giblets, head, neck and internal organs. Give the chicken a rinse and then pat it dry with some paper towels. 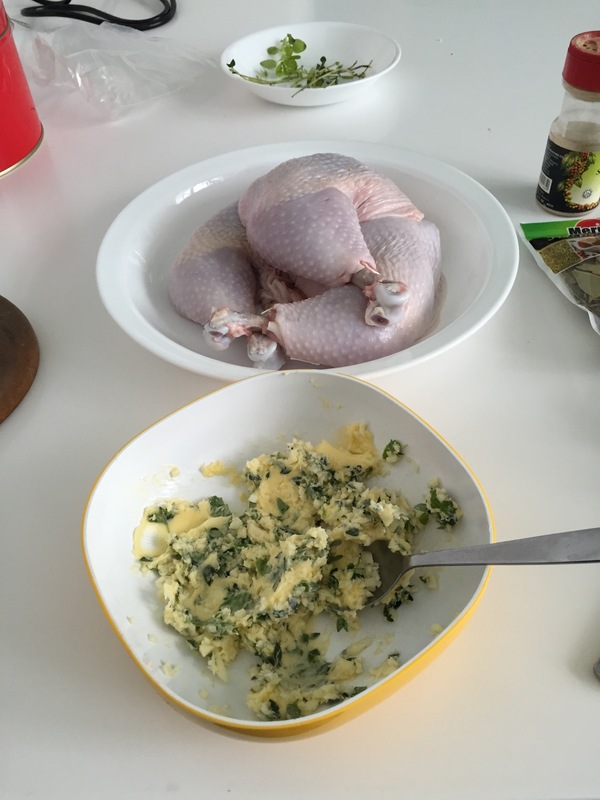 Gently separate the skin from the meat of the breast and spread the herb butter on the meat underneat the skin. If you can get to it, try to spread it onto a part of the thighs as well. Take the remaining butter and rub the skin (do it as gently as possible so the skin does not break. It is very important to keep the skin intact and whole). 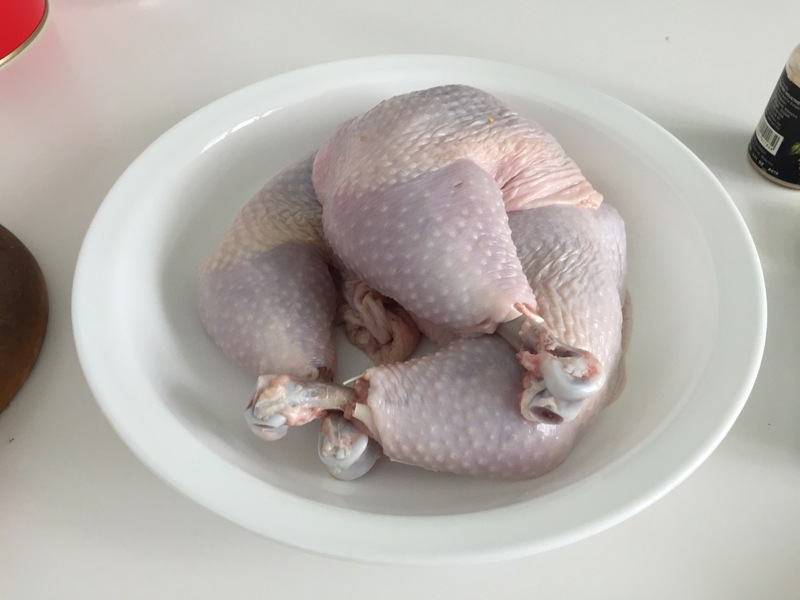 Rub some salt and black pepper onto the entire surface of the chicken, including the cavity of the chicken. 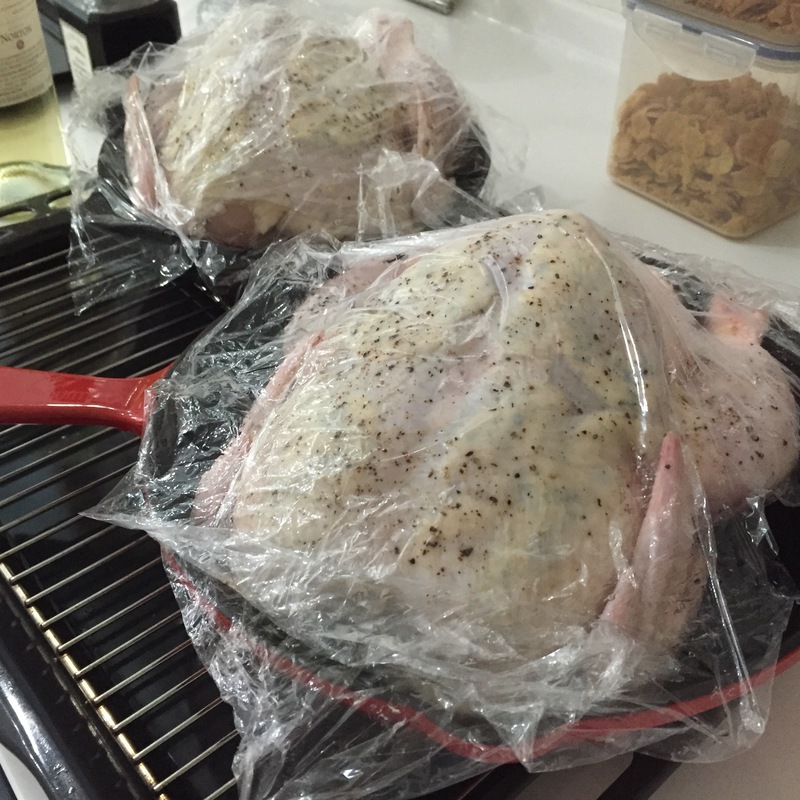 If you’re prepping the chicken the night before, cover the chicken with cling wrap and refrigerate it. 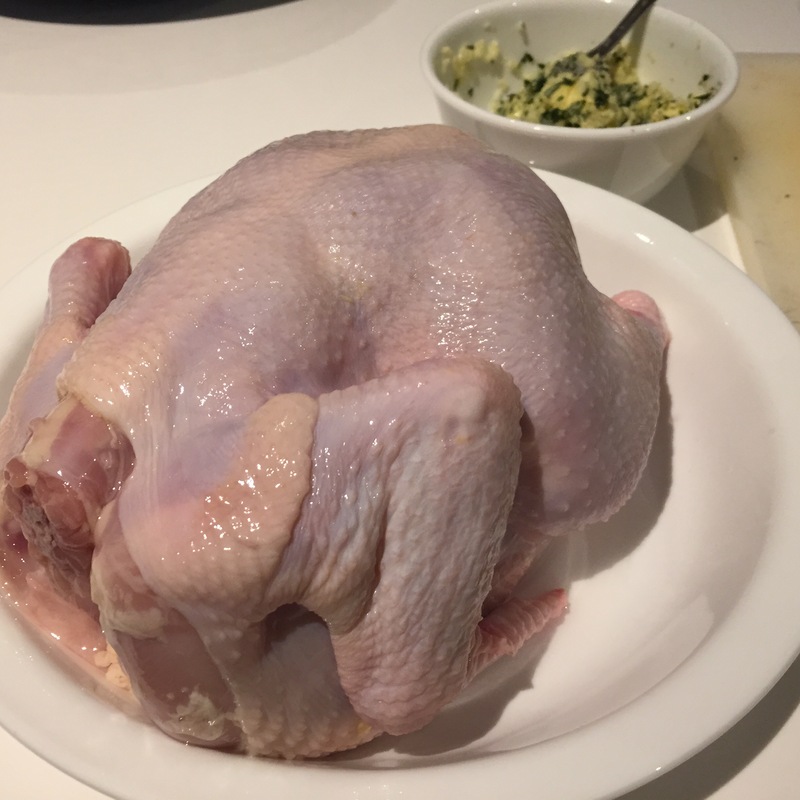 Some would condone leaving the chicken uncovered for crispier skin but I just can’t bear the thought of food exposed in the fridge! 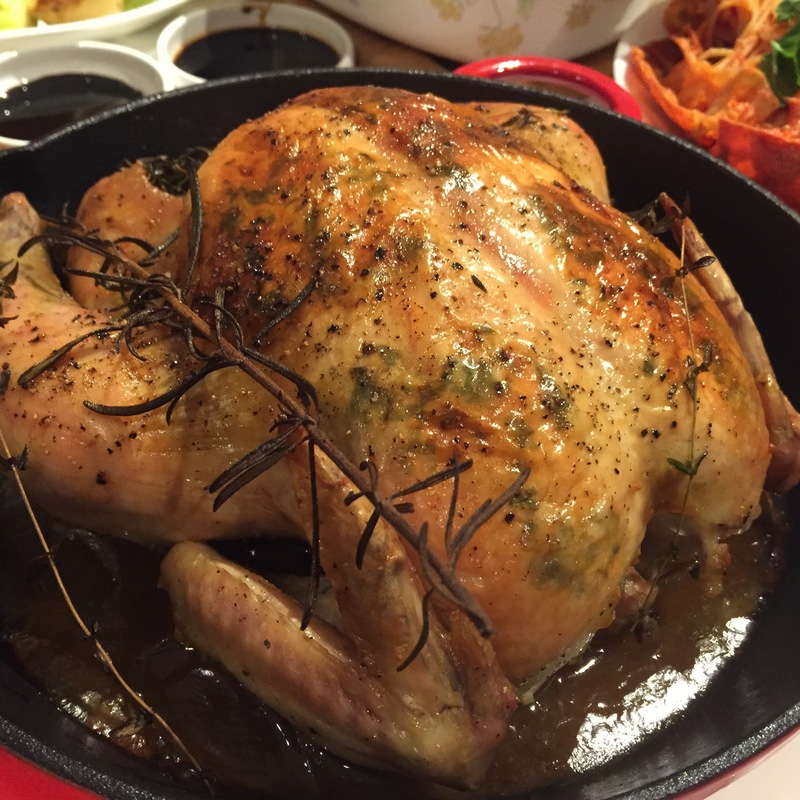 Take the chicken out of the fridge an hour before cooking. 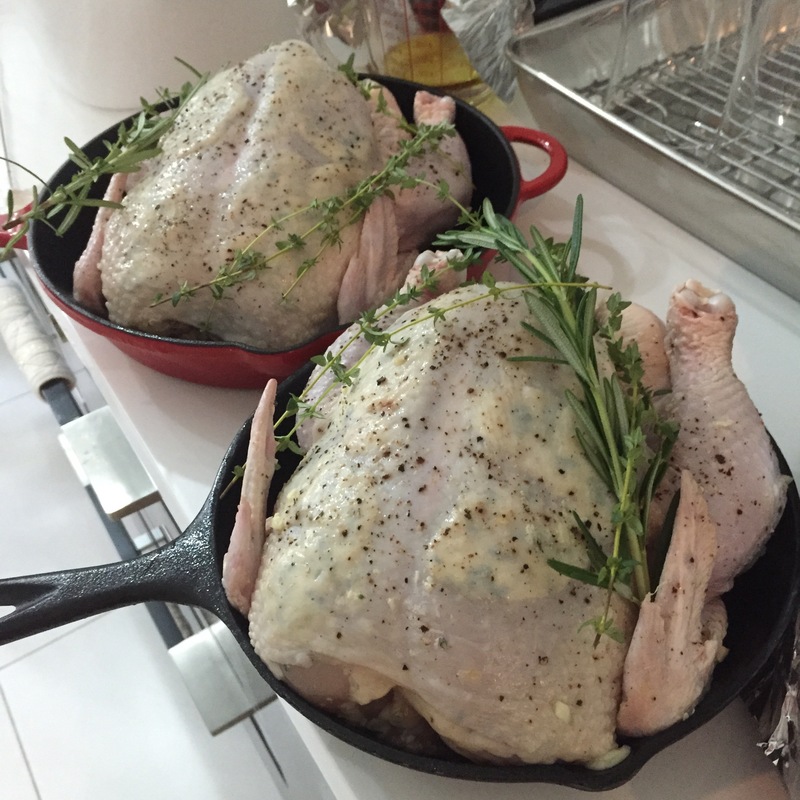 This makes for tender chicken and even cooking throughout the bird. Stuff the cavity with the onion, celery and 1 sprig each of the thyme and rosemary. Here I had stuffed a lemon into the chicken but I’d much prefer the onion and celery option. 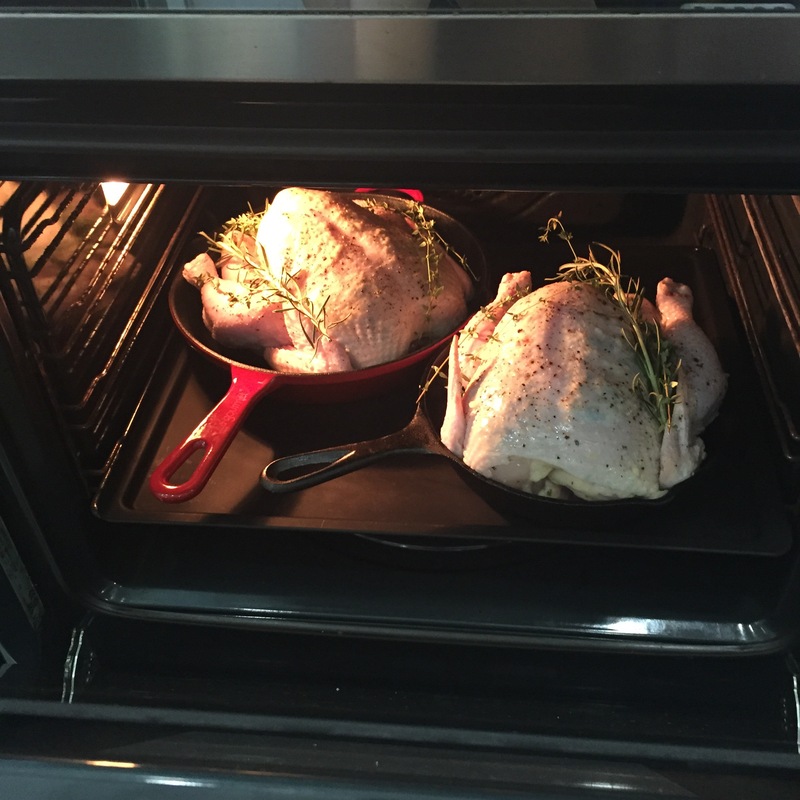 Scatter the remaining herbs on top and it’s good to go into the oven! Into the oven they go at 205 degrees celsius. 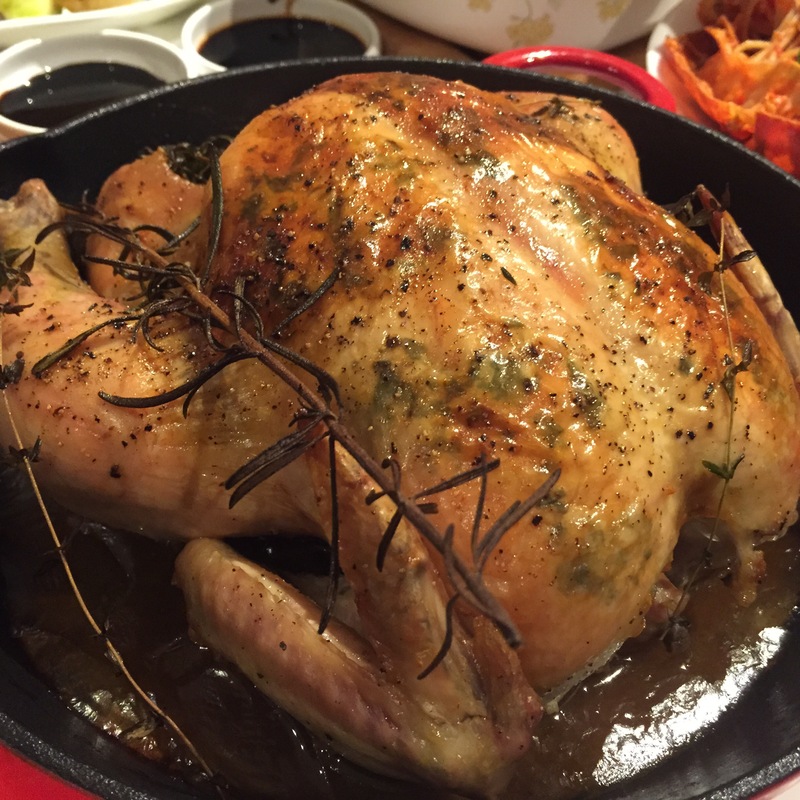 Roast for around 1.5 hours, basting the chicken in its own juices every half an hour. 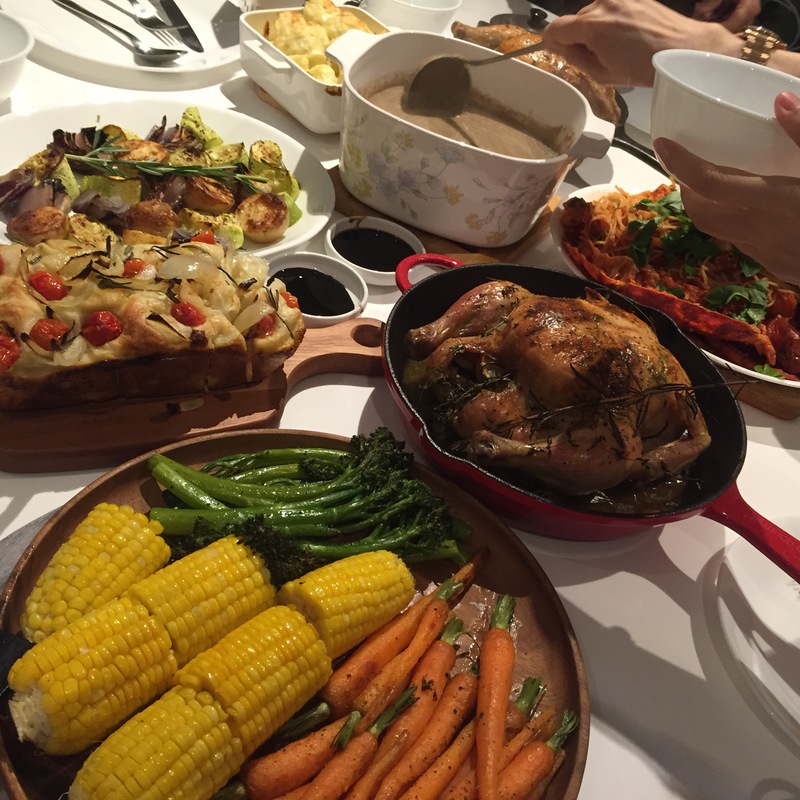 And there you have it, a hearty roast chicken that’s ready to be eaten with a variety of side dishes, as can be seen in the picture below! 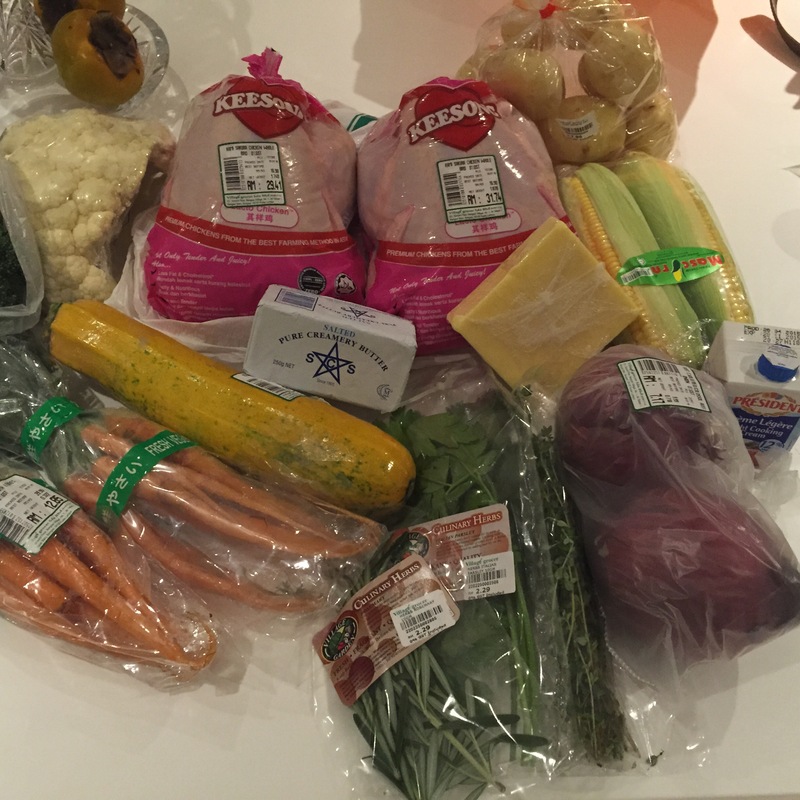 Roasted some vegetables (recipe to come), made some mushroom soup, lobster pasta, cauliflower cheese (recipe to come) and pomme puree (recipe to come) as well as gravy to go with the chicken. My sister also made some excellent focaccia bread to go with aged balsamic vinegar. I’m going to nick the recipe off her as well! 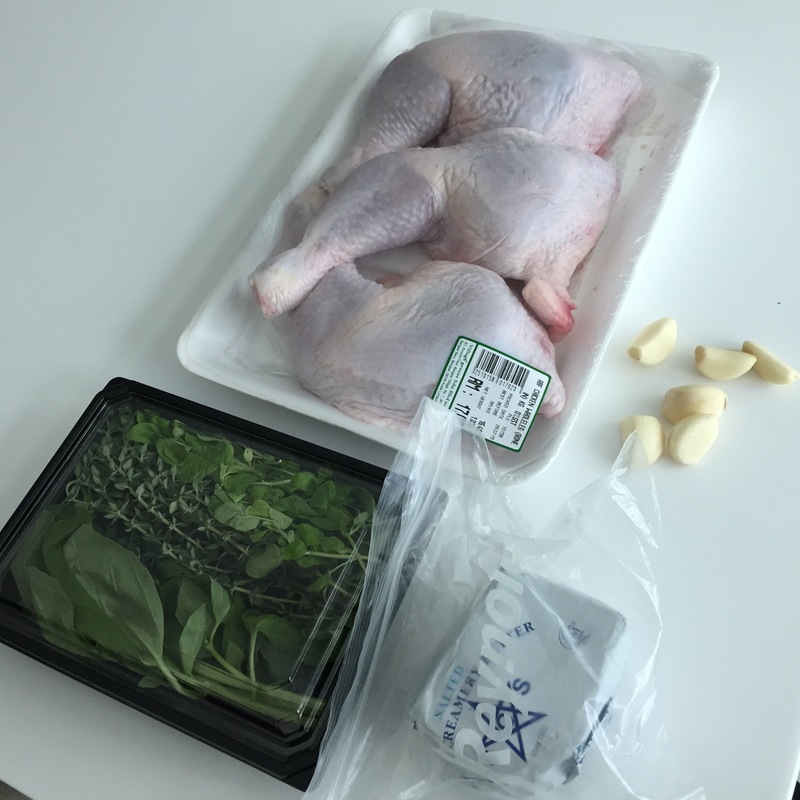 This is a good alternative when cooking for 1-2 people or if you simply prefer the thigh meat. Clean the chicken and pat dry. 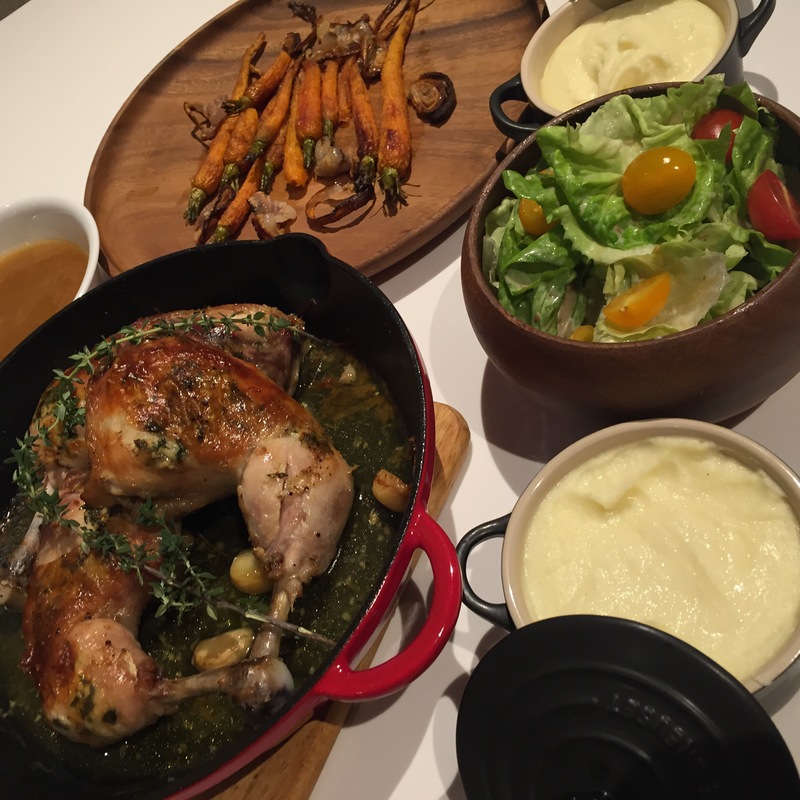 You can use the chicken straight away but I prefer to make it look … somewhat more posh and french. 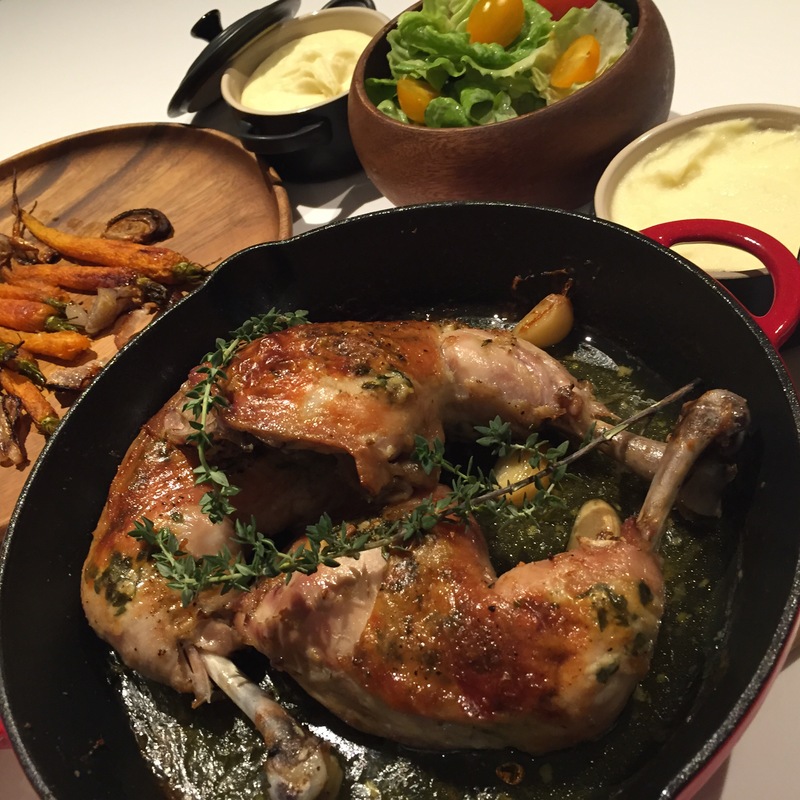 With reference to the above picture, I cut around the bone near the end of the drumstick. 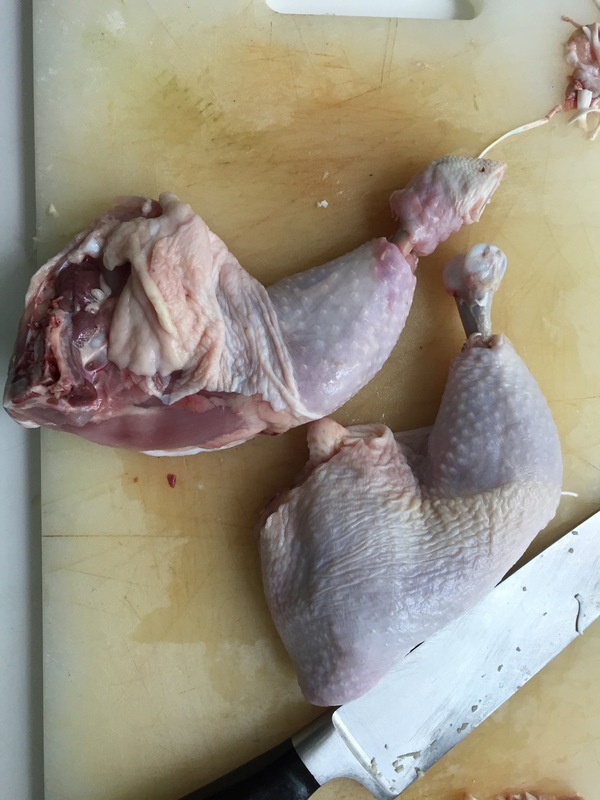 What happens is that I cut through the tendons and sinew (as seen in the top chicken). Remove visible tendons (they’re tough to eat). After which I proceeded to remove all skin, bone and cartilage from the bone end of the chicken, thus resulting the the chicken on the bottom of the picture. All cleaned up at the end. 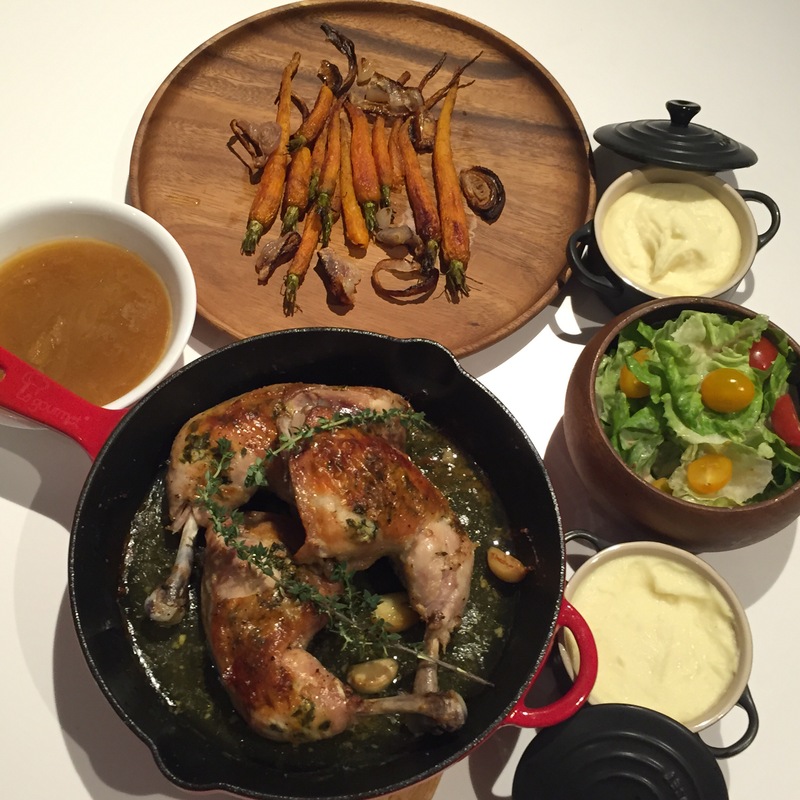 Chicken quarters cleaned up french style. Smear the compound butter under the skin as evenly as you can. Tempt the dog (dog doesn’t seem tempted at all). 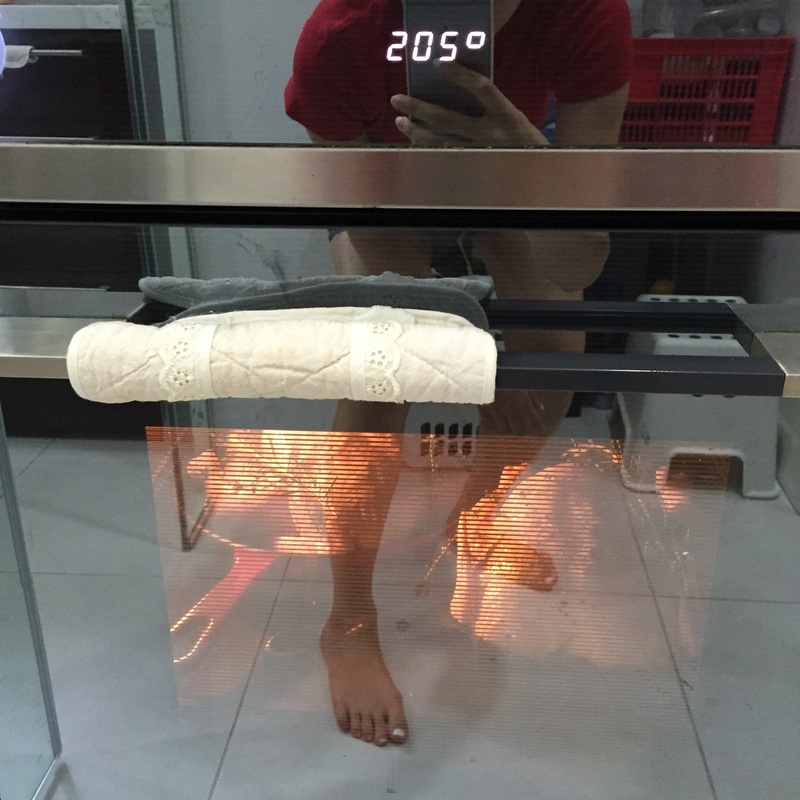 Place the chicken into the oven preheated at 205 degrees celsius (ignore the 190 degrees seen in the picture) for about an hour or until juices run clear and the skin is golden brown in colour. 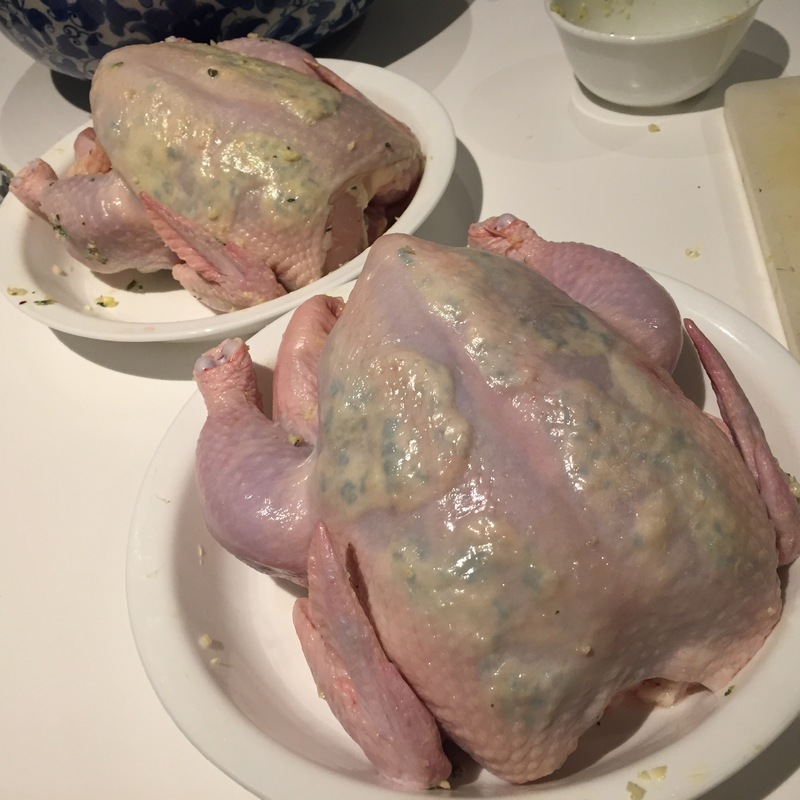 Don’t forget to baste the juices onto the chicken, a couple of times will do I should think. That’s it! Oh and if you have spare sprigs of herbs, go ahead and arrange them onto the completed dish for decoration. Quick post: Roasted chicken thighs! Been a while since my last post! 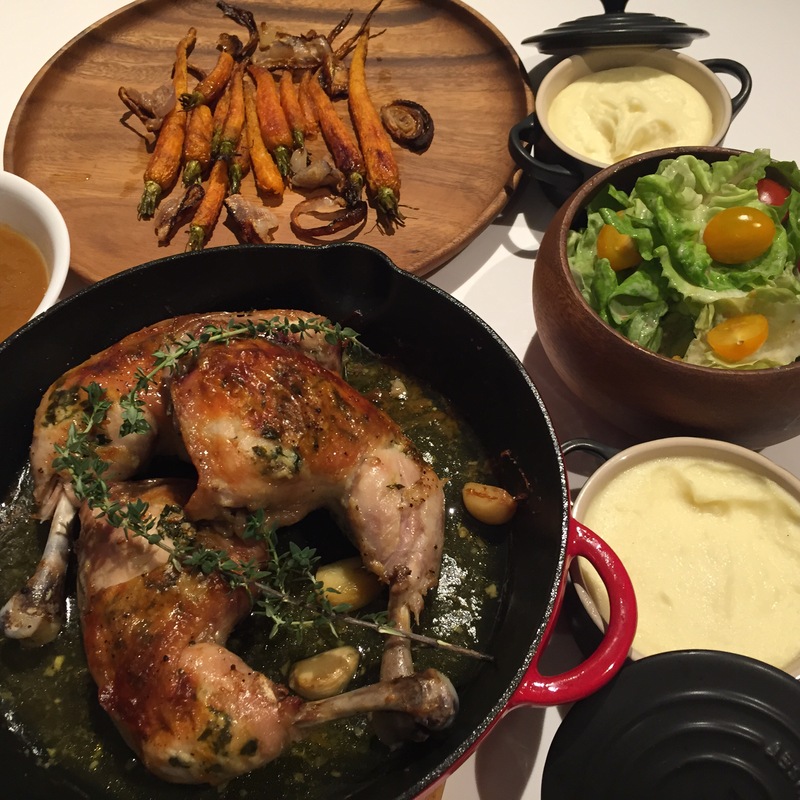 Coming up: myhumblefood recipes for pomme purée (basically an incredibly light and creamy French version of mashed potatoes), chicken gravy from scratch and the roast chicken. Just got back from Hong Kong and had the opportunity to have a meal at this restaurant. It is apparently the only Italian restaurant outside of Italy to have received 3 Michelin stars, having been awarded 3 stars by the 2012 Michelin Guide Hong Kong and Macau. I was so lucky to get a reservation at the last minute, thanks to a friend of my sister’s! 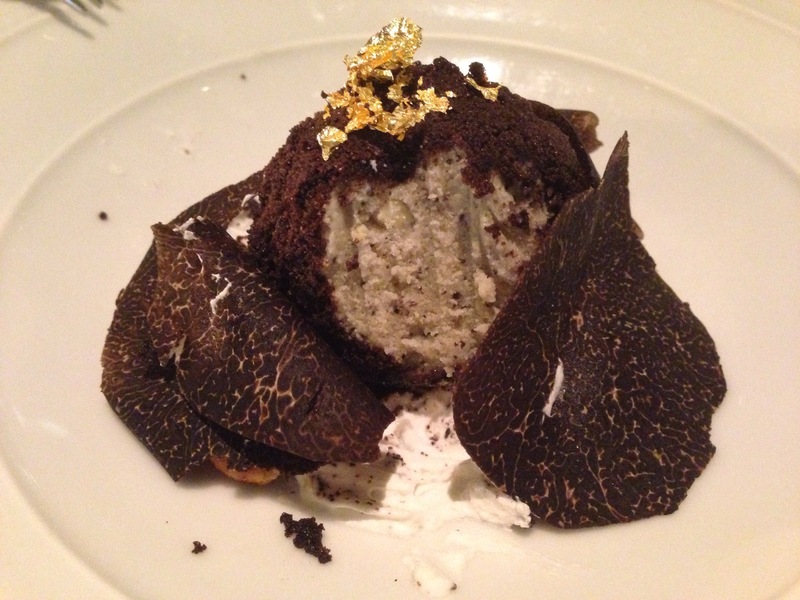 My goal for the night… EAT ALL THE TRUFFLES! I’ve been so tempted by all the photos of truffles coming out on instagram from this restaurant, as well as my sister who also ate there a week before I went to Hong Kong. 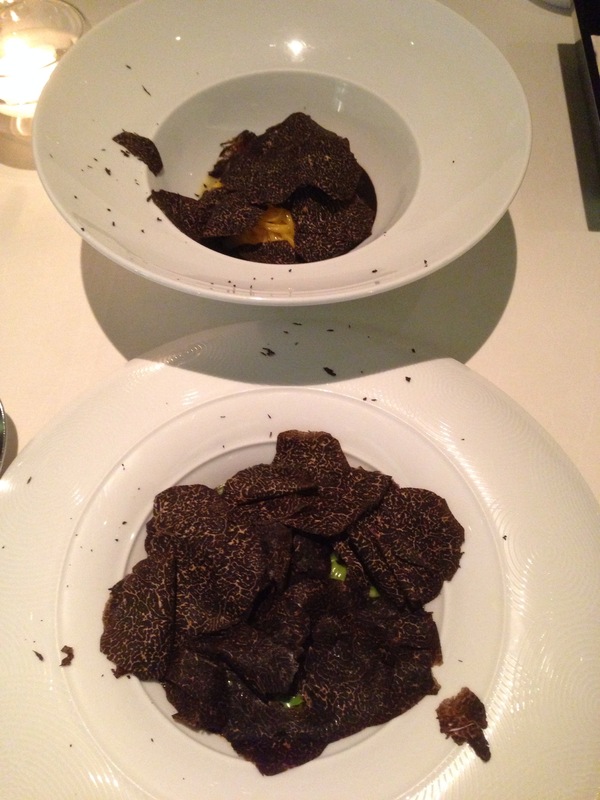 So yes… we didn’t go for the degustation menu but what we ordered seemed like a more expensive degustation by itself! Such that the Caucasian women on the tables next to us looked over at us in disgust at the amount of food coming to our table for just 2 of us ;D We are Asian, and we are naturally greedy. Plus the dishes are mostly dainty and in small portions! 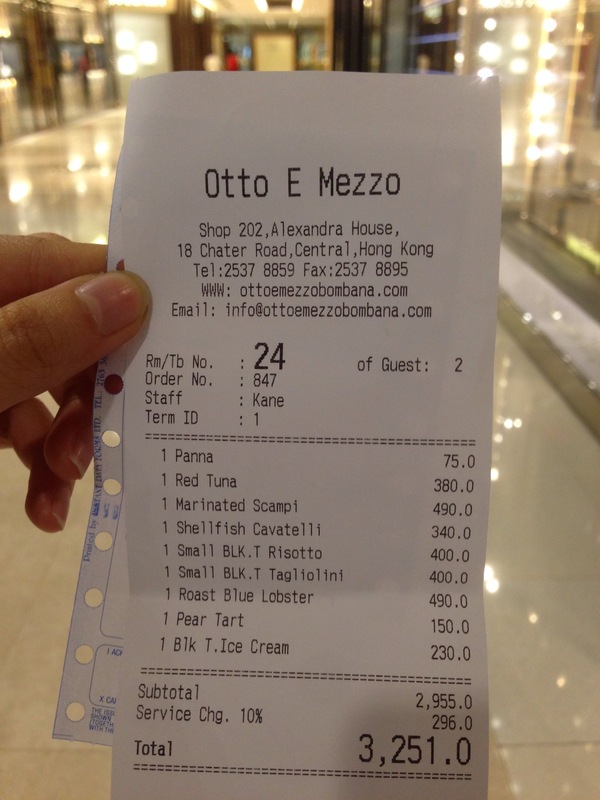 We ordered 2 starters, 3 pastas, 1 main and 2 desserts. Even the waiter was aghast. No matter! I looked forward to a great meal and wasn’t disappointed at all. 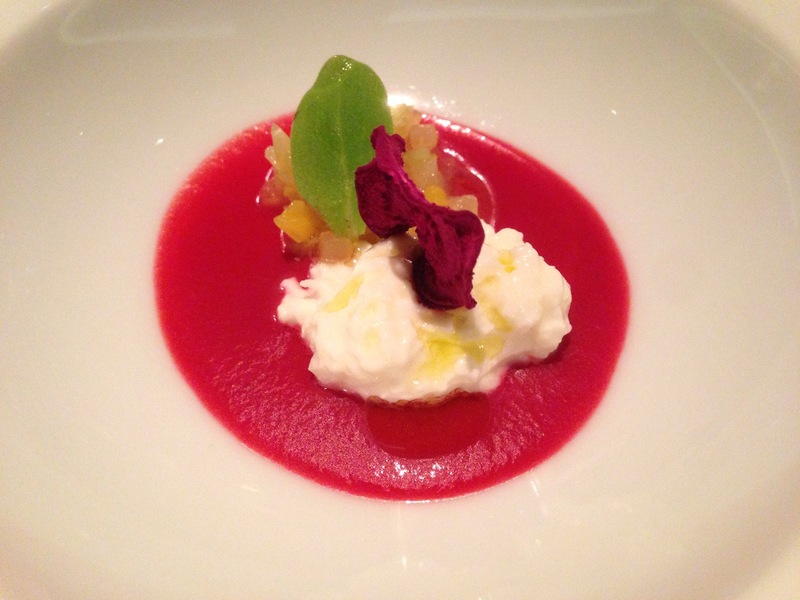 The amuse bouche came first, though I didn’t catch what it was. Could very well be a blend of fruit and cheese? I can’t really tell what it was. Quite refreshing though. 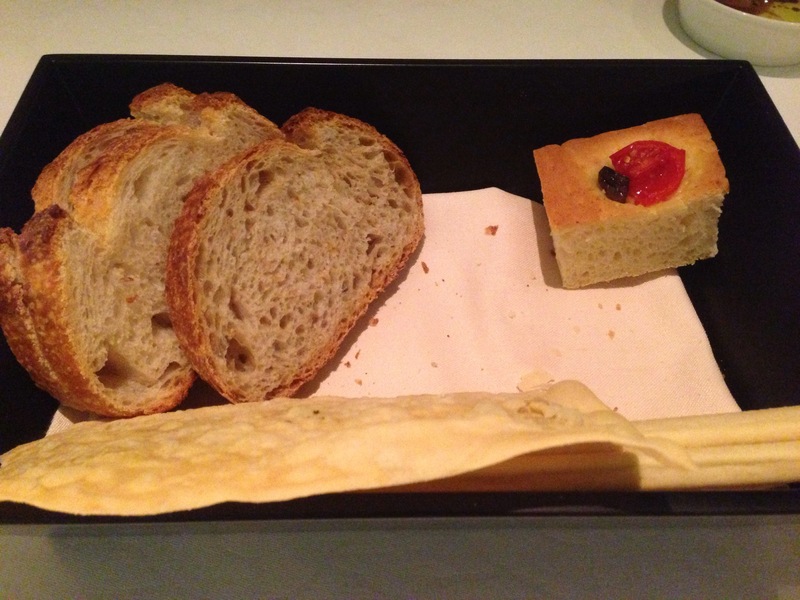 Yes, the bread basket…. the bread is warm! I loved the foccacia! Its the one on the top right. It had a crispy top with some sun-dried tomato and olive baked onto the surface and warm fluffy insides. It’s been so long since I had good bread at a restaurant! I only ate the focaccia but my friend loved the brown bread beside it. Again it had that crunch to it as you bite into the bread, but yet you don’t have to gnaw it to death to take a bite out of it. The waiter had to top up our bread basket with fresh warm bread. How embarassing… and we kept on eating even the 2nd basket. Luckily, our first appetizer arrived in time to stop us. 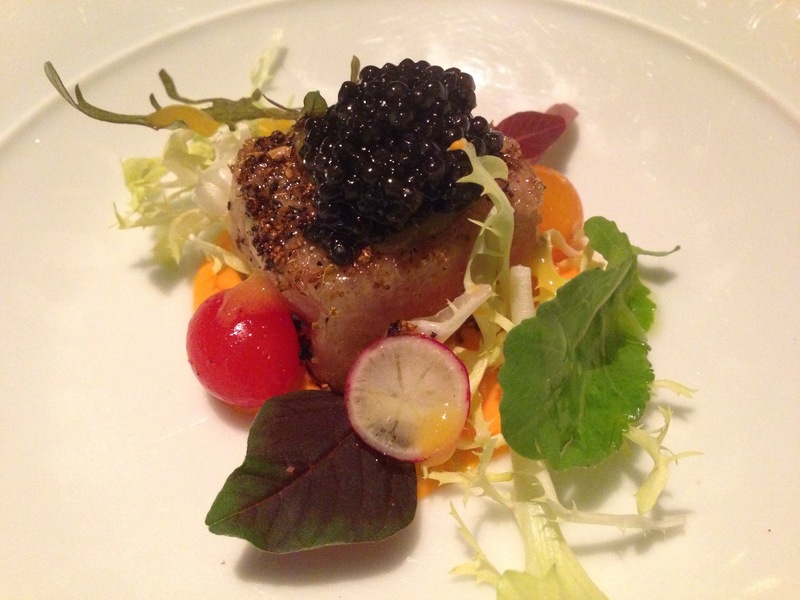 This is seared tuna topped with caviar with some dainty salad. They were so nice to split the portion into two plates for us, so this was my portion. 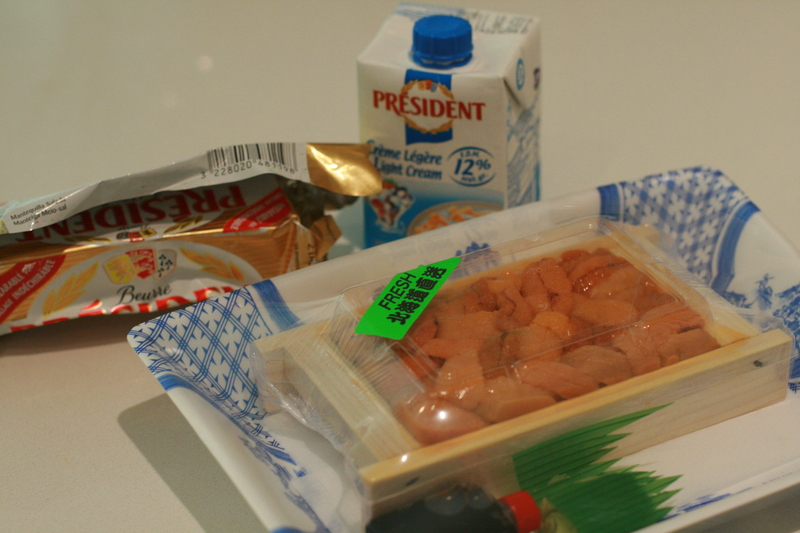 I could have sworn that the tuna is of the akami type, the leaner part of the tuna. It certainly had that ruby red hue to it. But when I bit into it, it had all the full flavour of seared fatty tuna. 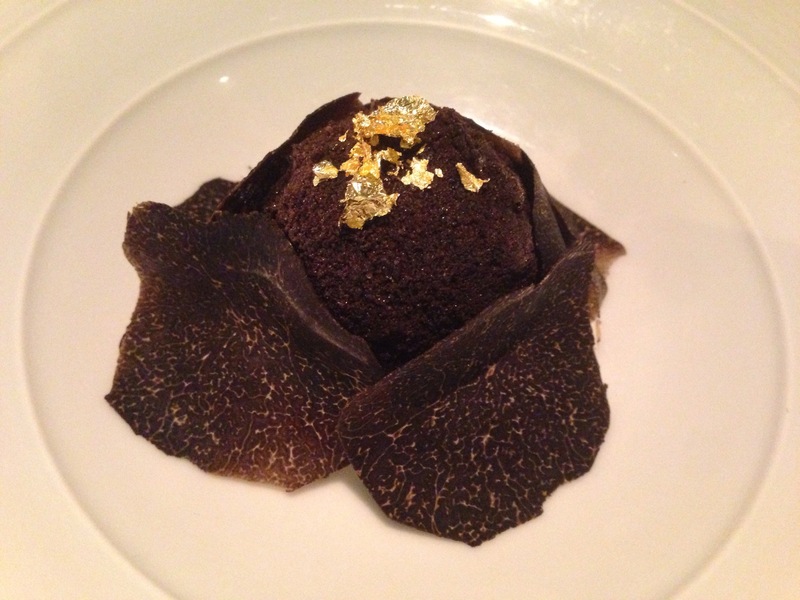 It was beautiful, along with that gorgeous mountain of caviar in unison with a slightly tart and rich sauce. 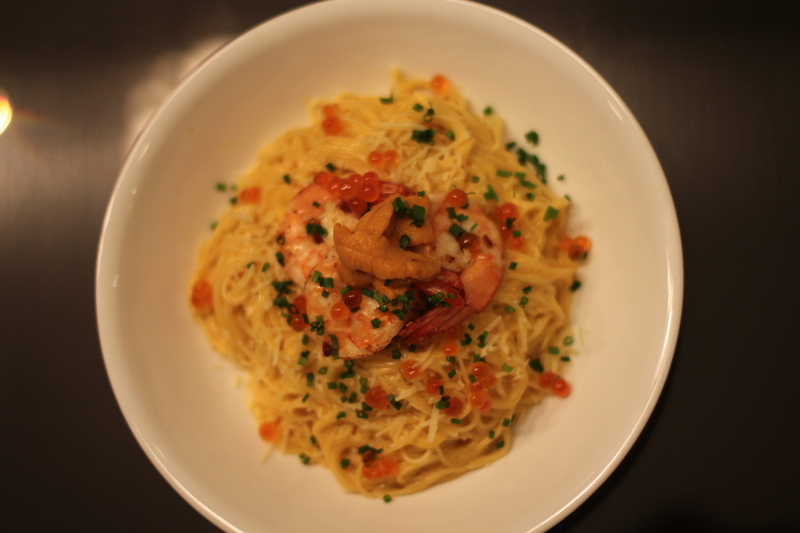 Next, the scampi topped with truffle shavings. The scampi carpaccio is fresh, in some sort of olive oil emulsion if I’m not mistaken. 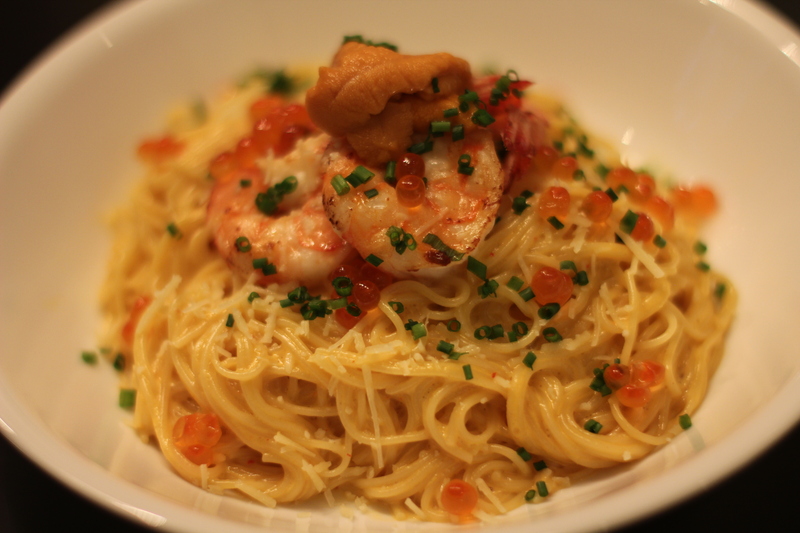 It is similar to the truffle tai carpaccio at Aoki but I prefer the texture of tai compared to the scampi. 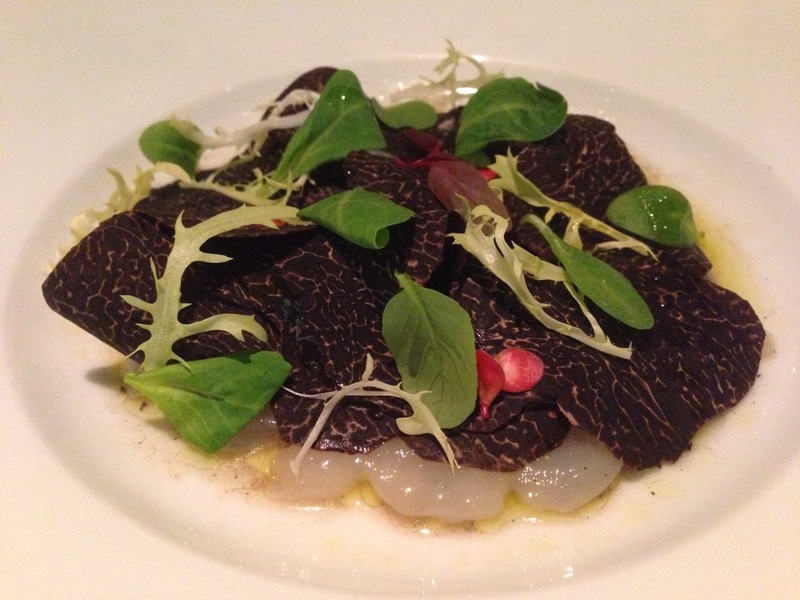 Plus the flavours didn’t blend as well as the truffle tai carpaccio. So while this was nice, it wasn’t one of the must haves for the night. I hear that there is an octopus version of this that is really nice too. 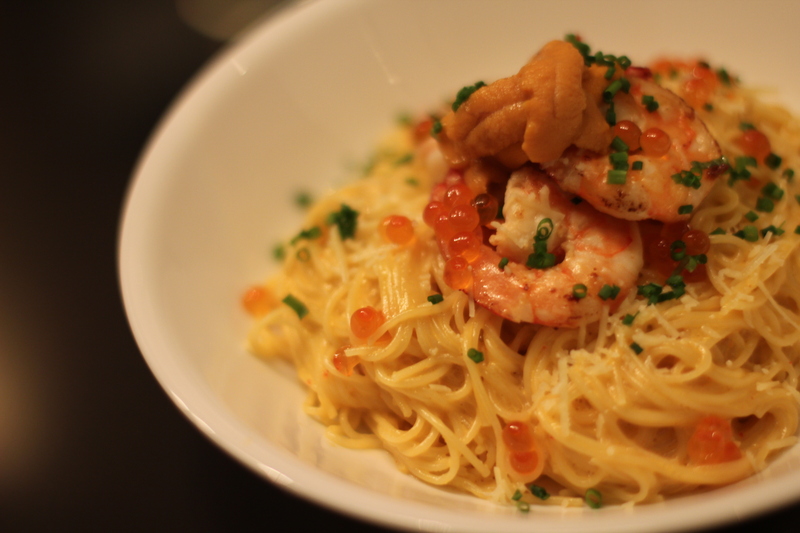 Next up, the pasta dishes. 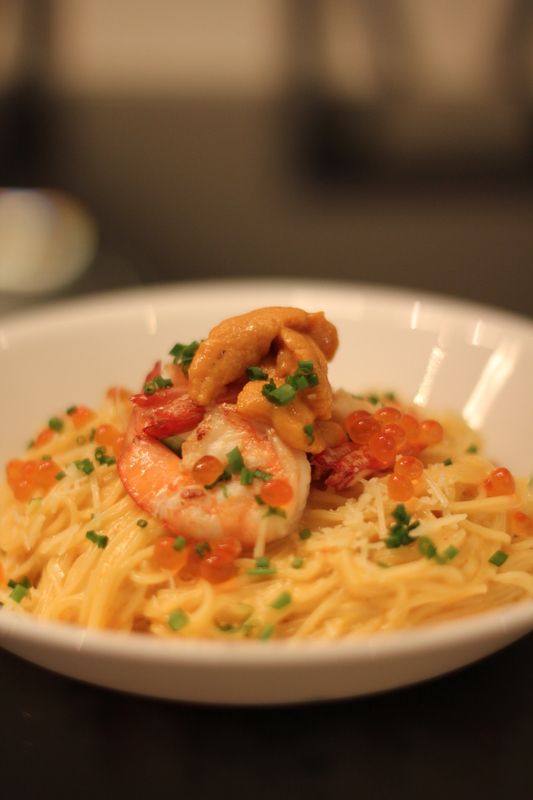 Shellfish cavatelli in a delicious seafood bisque with chanterelle mushrooms. 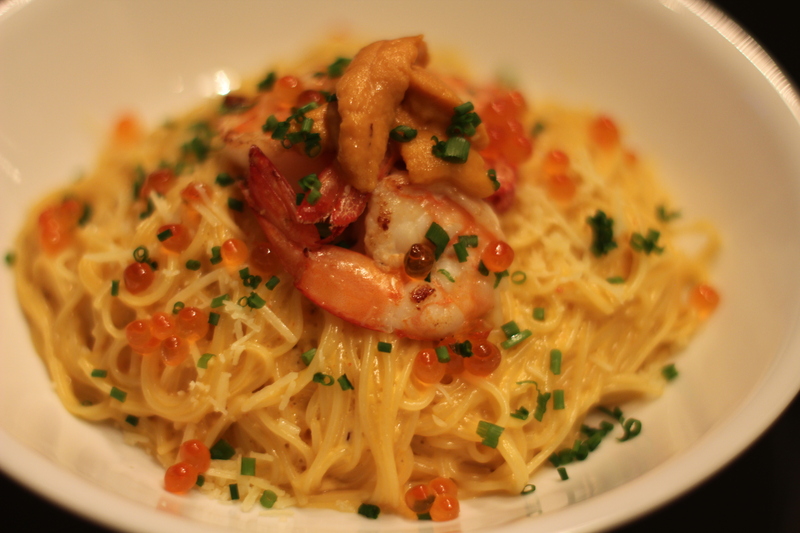 Sometimes this is topped with sea urchin, but I think that could be seasonal. This was amazing! And also half a portion as my friend and I shared the cavatelli as well. The seafood bisque was full flavoured and bursting with ocean goodness. It wasn’t heavy at all and left us unabashedly scraping at the bottom of the bowl to get at every last drop. 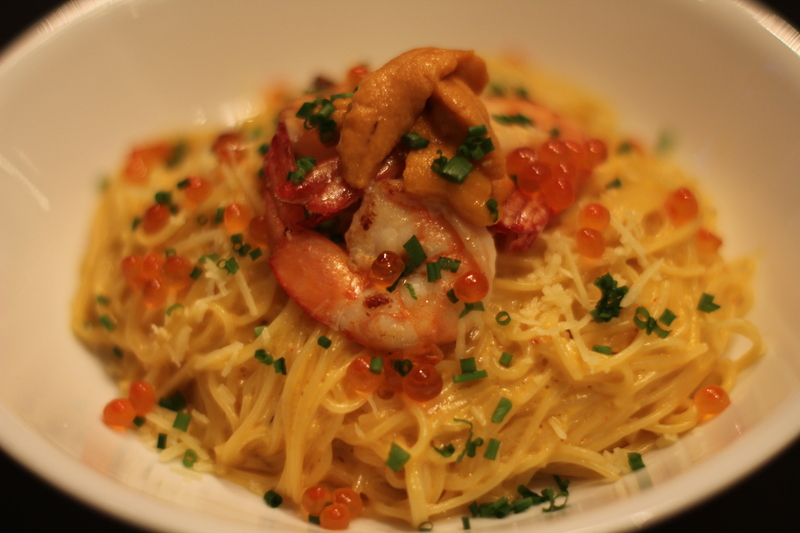 The pasta, while I wouldn’t normally order pasta in this style, is great with the bisque and the perfectly cooked shellfish. Nice bite and texture to it but I’d say the shellfish and bisque were the stars of the dish to me. More pasta dishes up next, we couldn’t decide between the risotto (which was highly recommended by my sister) and the more traditional tagliolini (which was highly recommended by the waitress), so she suggested we take both in a small size. We happily took her suggestion to heart…. This is the risotto, I’m not sure why its green again but it was well cooked with a nice bite to it. You can’t really tell in the picture but both pastas had a ring of dark sauce around it. 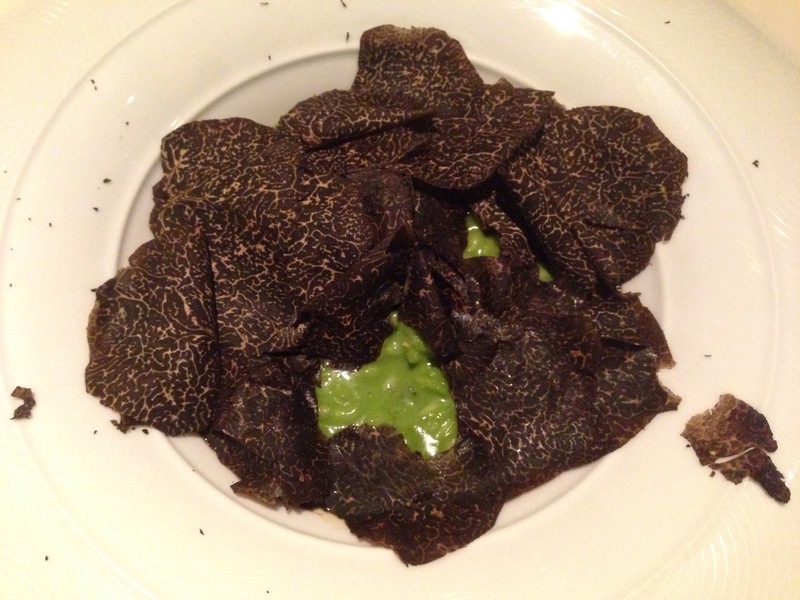 I’m assuming this is the truffle emulsion and it tasted like a dense, truffled wild mushroom soup. 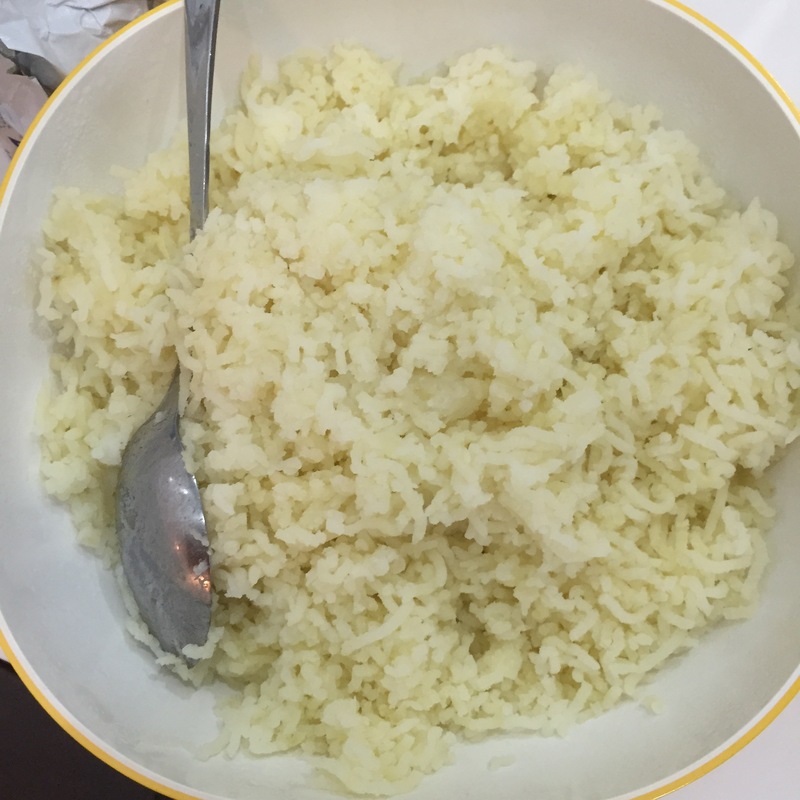 Together with the risotto it added more depth to an already rich and aromatic dish. It is a really small serving, however, you can probably finish it in a couple of spoonfuls, just enough to savour and appreciate the mix of earthy and nutty flavours in this gorgeous dish. 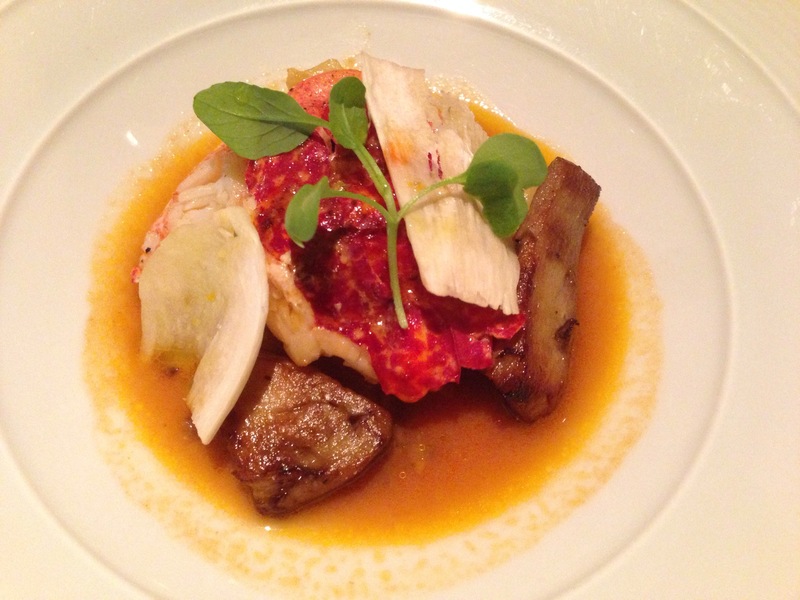 Our lobster main, cooked perfectly, still had that balance between raw and cooked in the center which I really liked. Texture-wise the lobster had a smooth cut to it so that it is still retained that creamy texture. 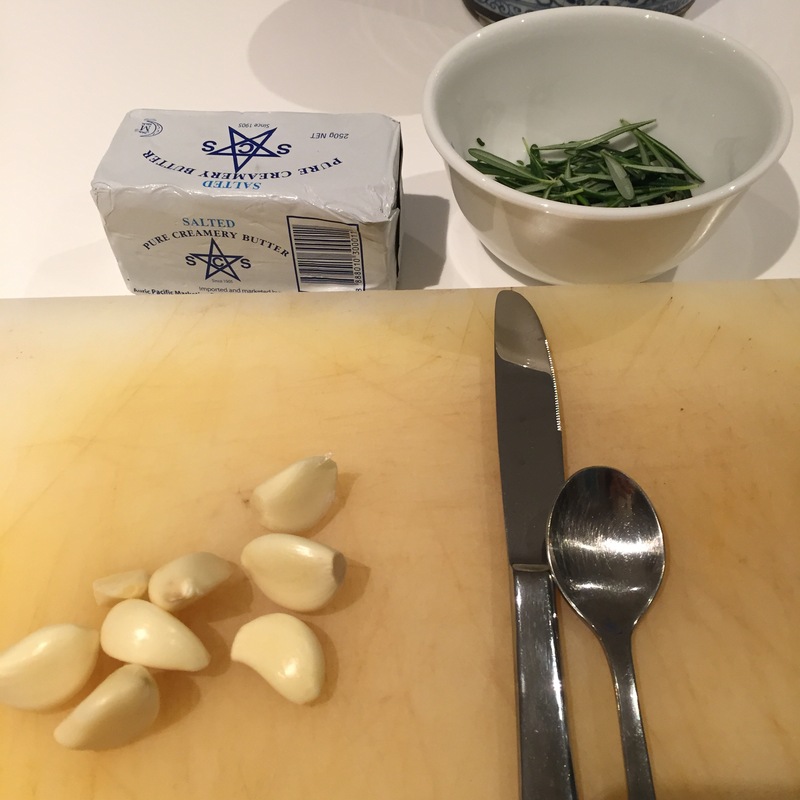 Again…that sauce/broth that came with it? Amazing. I’m not sure if its the same broth as before with the pasta, but it had that same full flavoured brine to it. 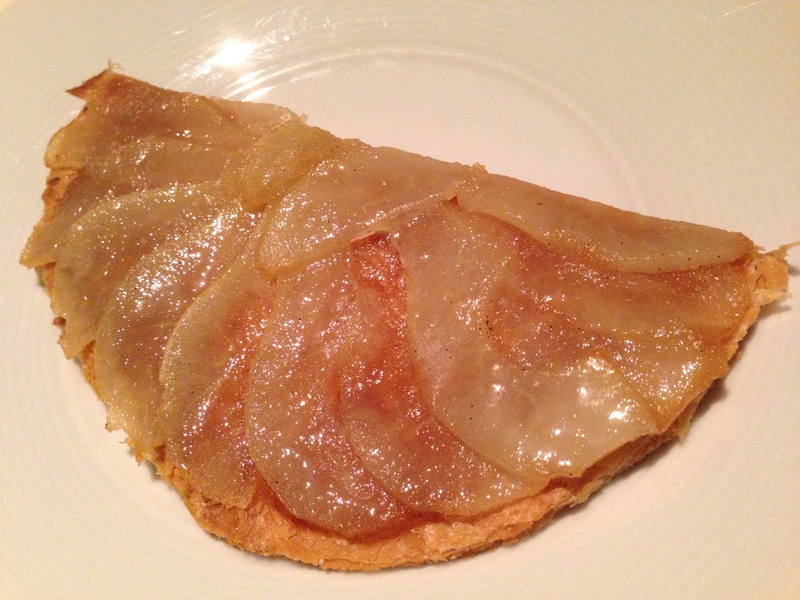 This pear tart came highly recommended by my sister. 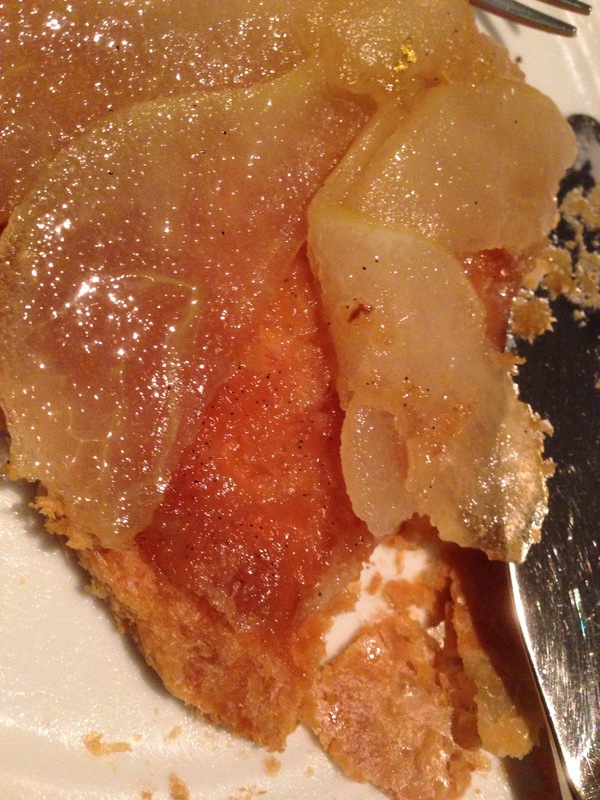 Its got an almost wafer thin flaky crust topped with very delicately sliced pears. I must try to make this one day!!! Very warm, slightly spiced and crispy dessert which ended the meal perfectly. Just for fun, I’ve included a couple of recipes from Otto’s website. I’m sure I’ll never be able to make it as well as they do despite them openly sharing the recipes like this! • Put the bowl in oven at 200 degree for 2 hours. • When the serve take out the short rib and heat again in sauce, and pan fried the beef tenderloin in pan. Sift all the dried ingredients. Make meringue with sugar and egg white. Fold in the dried ingredients with meringue and spread on the tray. Bake 180 degree for 12 minute. Roast the coffe bean for 10 minutes at 200。and add into the boiling milk. Infuse 30 minutes. 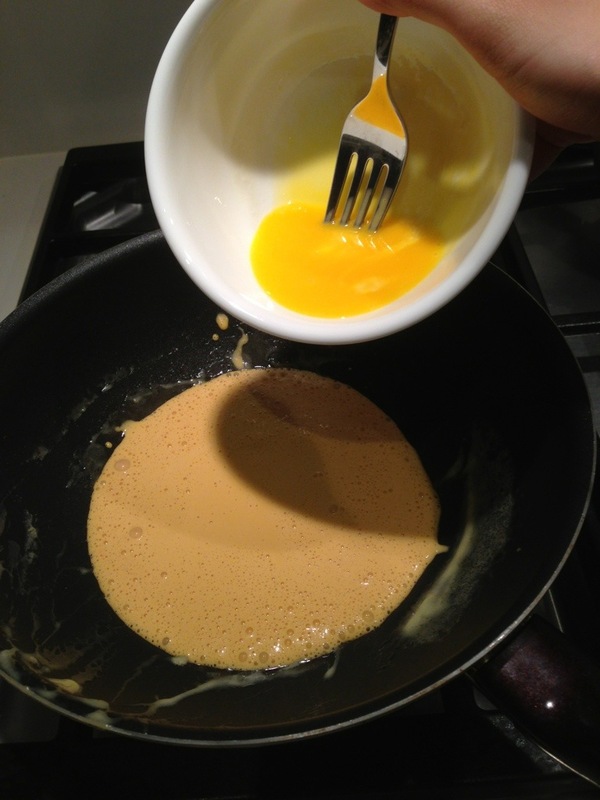 Mix sugar and egg yolk and add the cold cream. Mix the coffee powder with warm milk, combine all the mixture and sift. 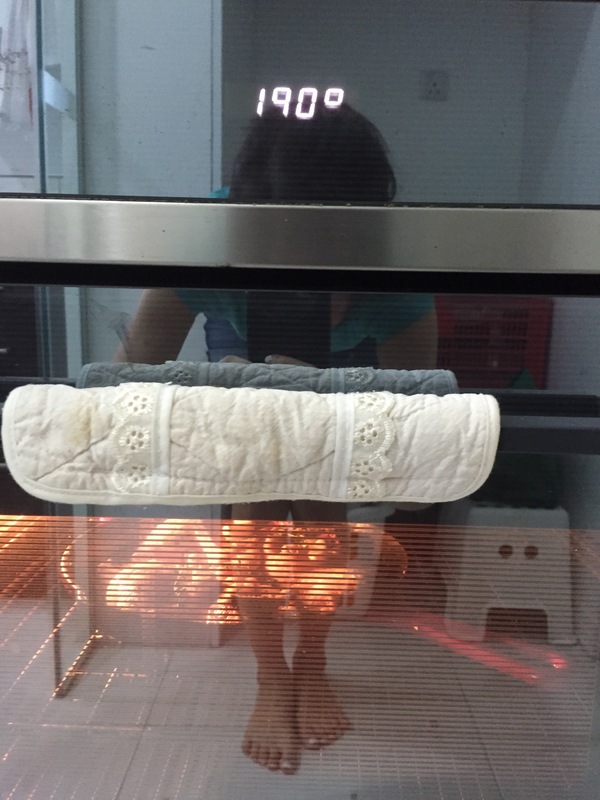 Bake at 110 degree for 35-40 min. Sea urchin roe is one of my favourite sashimi! 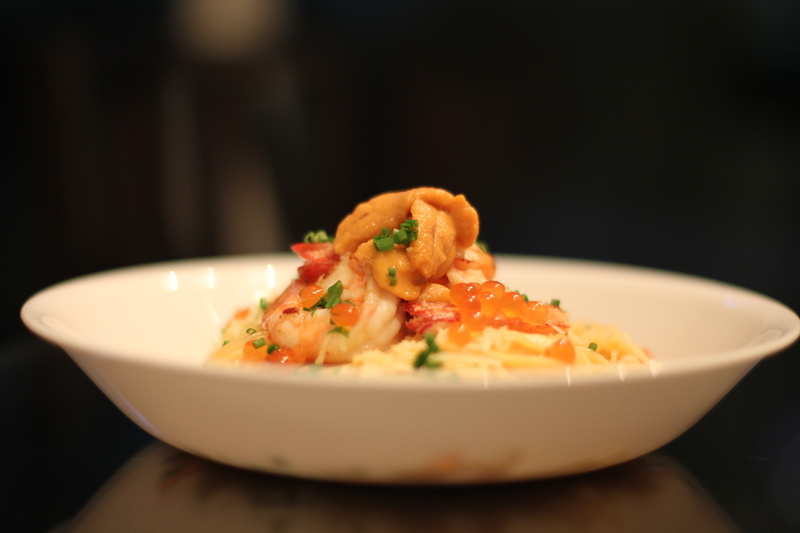 So rich and creamy and briny <3. 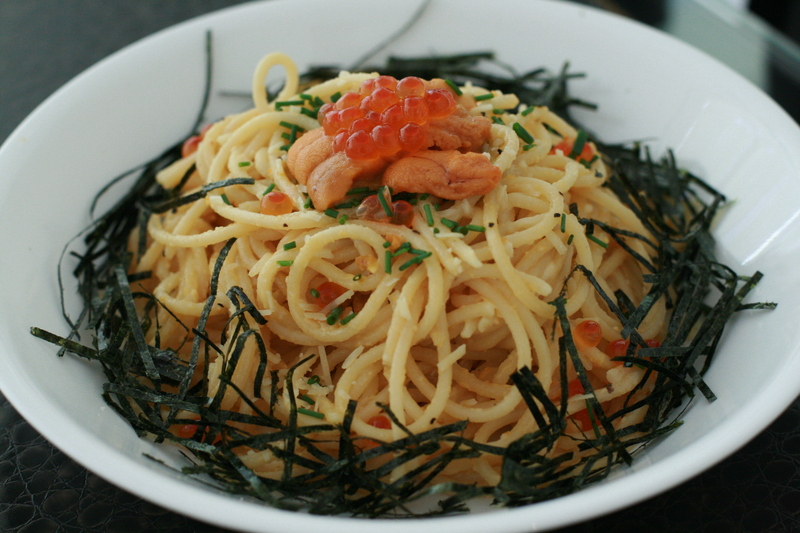 I tried sea urchin pasta for the first time in Japan a few years back and it was amazing as well. 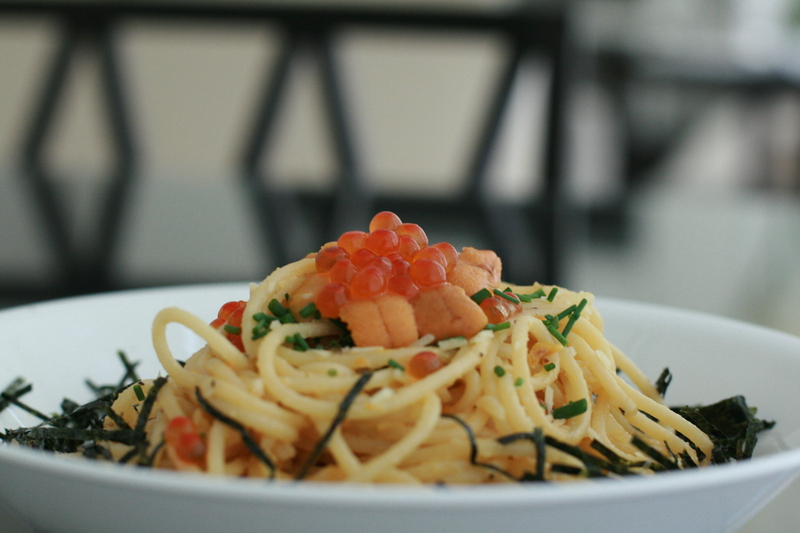 And of course I had to try to make it myself, but I always feel heartsick at the thought of throwing all the expensive uni into pasta when I can just have it as sashimi and savour every single bit of it. 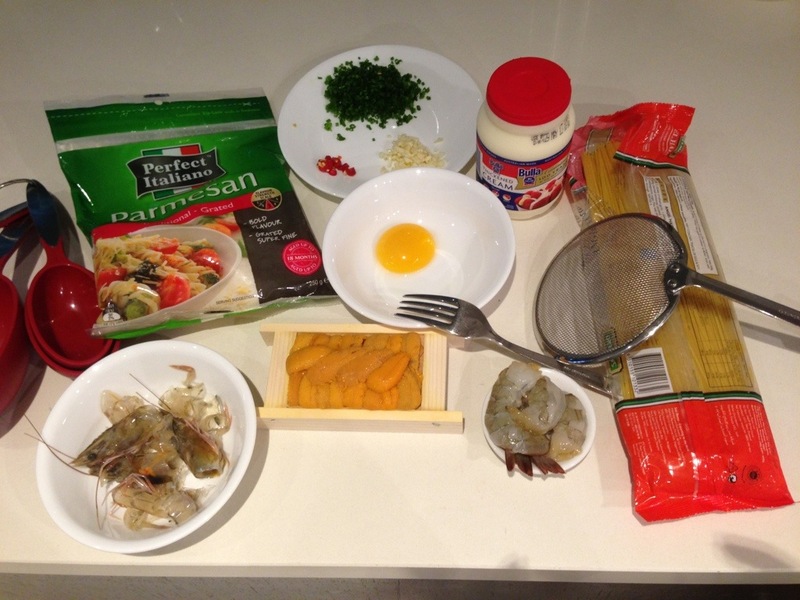 That’s why on my first attempt at uni pasta, I just used a few bits (see the following 3 pictures). I probably used a quarter of the package of uni. The box of uni in itself is already really small, so the uni flavour in the pasta wasn’t as prominent as I would have liked it. But the pictures were way better as I took them during the daytime, whereas my 2nd attempt photos were dependent on dim lighting =(. Pleased to say that on the 2nd attempt, the pasta came out creamier and more luscious! I sacrificed the whole box this time… just for myself *guilt*. I also omitted the seaweed as it got in the way of the flavour of the pasta. It goes better with mentaiko pasta I think. 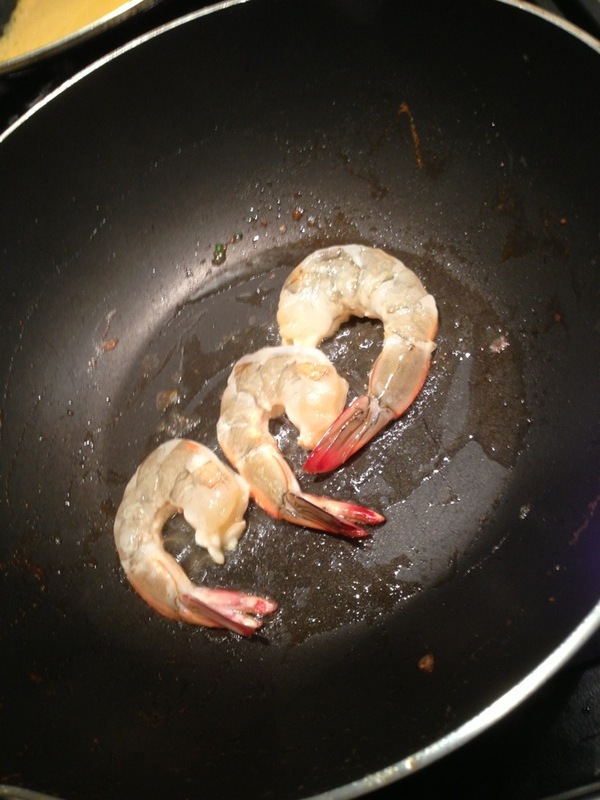 Melt the butter over low heat and add the prawn heads/shells in. 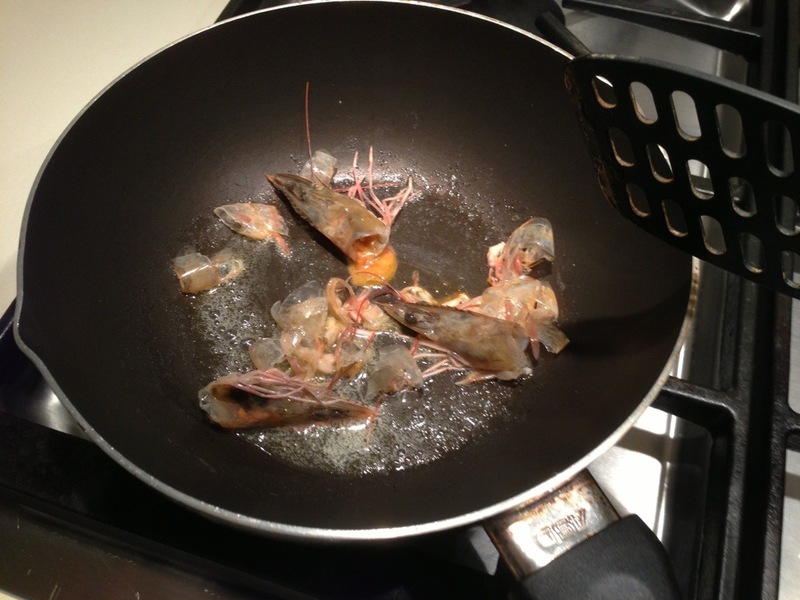 Crush the prawn heads so that all the flavour comes out into the butter. Take the pan off the heat so that the butter doesn’t brown and continue crushing the shells. Throw in the chilli padi and the minced garlic into the pan with the prawn head butter and fry until the garlic turns golden. If you like, you can also add a little more butter. Add in the cream and bring to a simmer before switching it off. Don’t boil the cream. When the cream has cooled a little, pour into a blender. 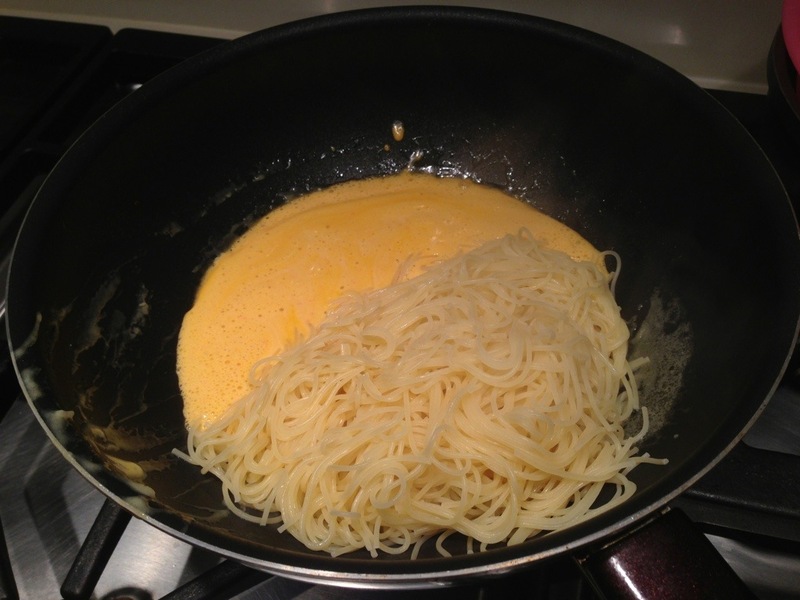 Your cream shouldn’t be hot as this would cook the uni and scramble the egg later. 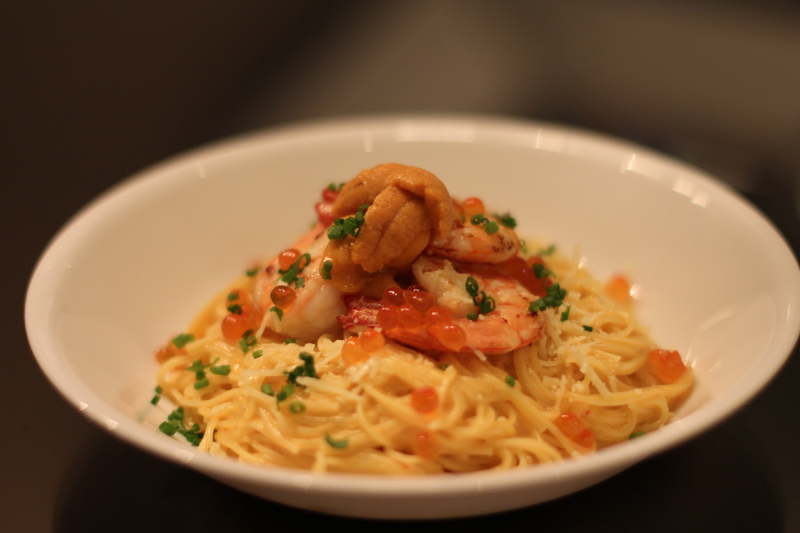 The uni needs to be soft, raw and creamy while the egg yolk needs to be silky. Save a few pieces of the uni for garnishing, and add the rest to the cream. Blend the uni and cream (just need to give it a few pulses) and pour the mixture back into the pan. 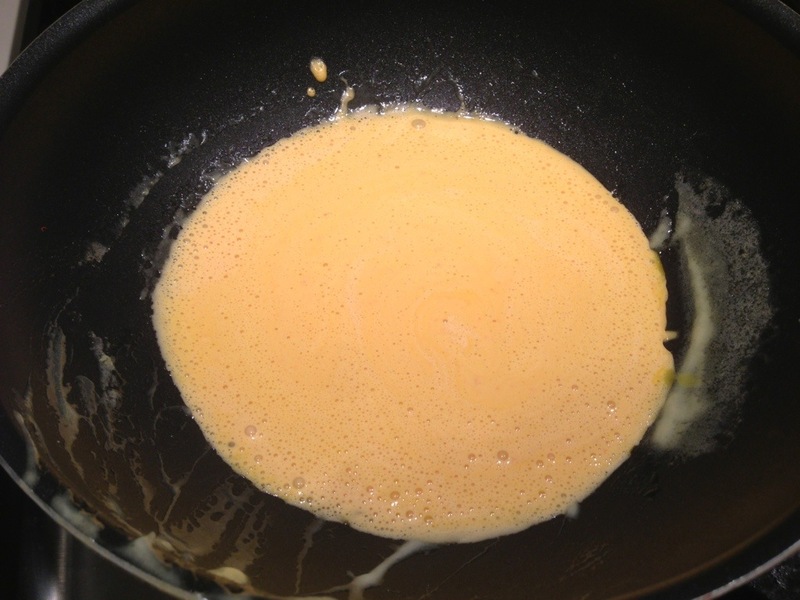 Add the beaten egg yolk and stir it in. Add in the freshly cooked pasta and mix it into the sauce. If you have strong wrists, toss the lot to combine.